Additions for 2019: 178, 228, 95, 172. Additions for 2018: 351, 311, 261, 39, 54, 21, 239. Additions for 2017: 61, 187, another Coinless, 252, 65, 342, 162, 333. Note: I am looking to by 1971 Medallion Flying Vs and 1967-1969 Flying Vs.
My personal collection from 2014 is pictured below: I have since sold two of them and kept coin #130 which is near mint. 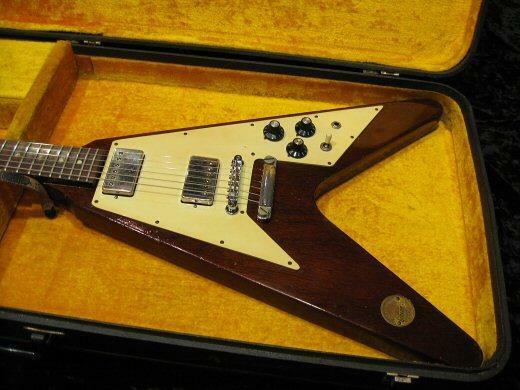 The 1971 Gibson Flying V Medallion is one of the coolest and most sought-after guitars in the world. There are very few of them left on the planet that are totally original and completely unmolested. As you would expect, serious collectors want the unmolested ones, but there just aren't that many available. 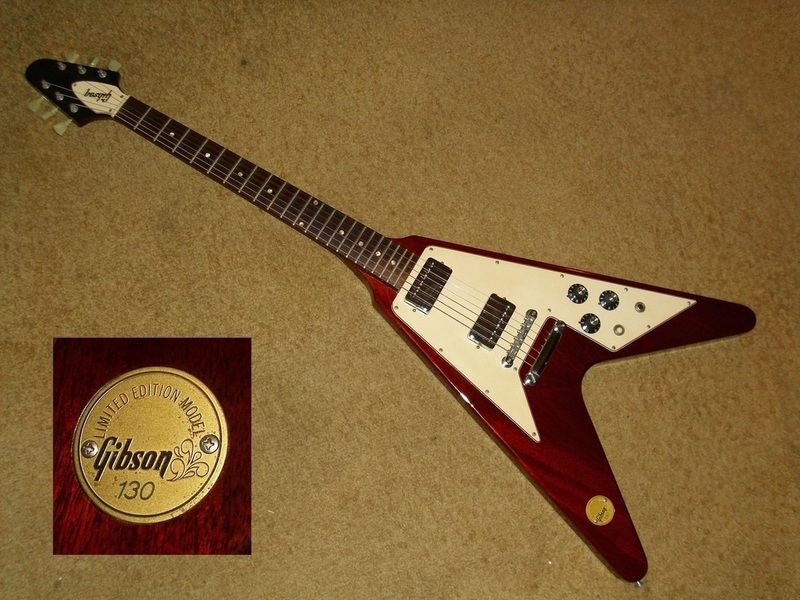 Gibson only made 353 Medallion Flying Vs in 1971. They were designed and built to commemorate the 1972 Olympic Games. 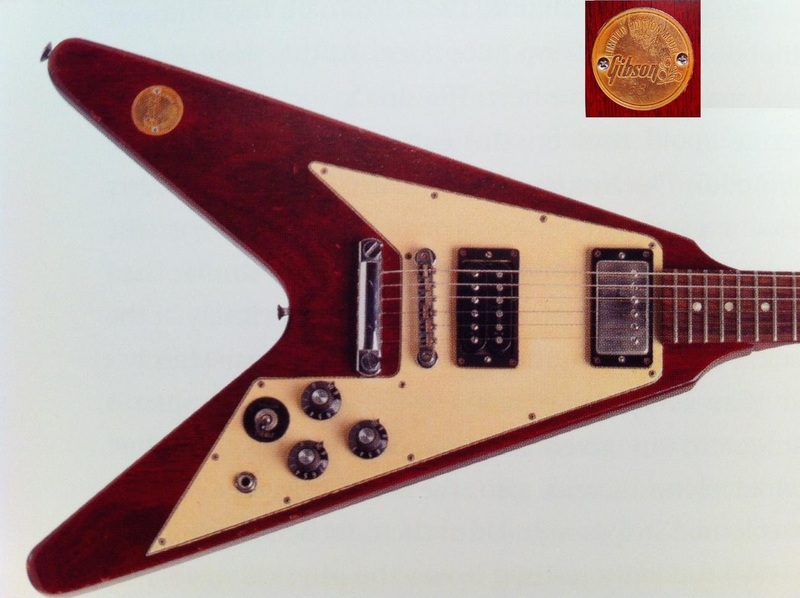 Each guitar had a gold coin affixed to the upper wing that specified the Medallion number (1 - 353). 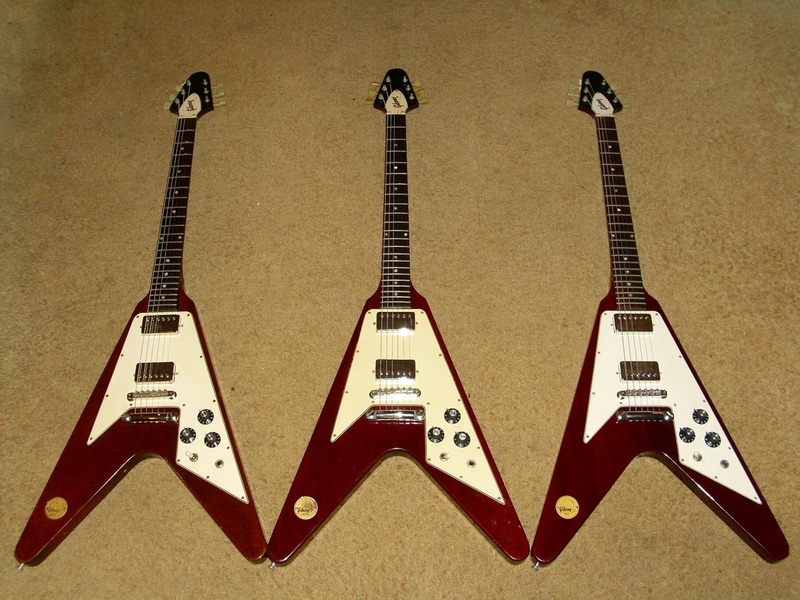 Of the 353 guitars that were built, I have accounted for 133 of them in the past 20+ years. 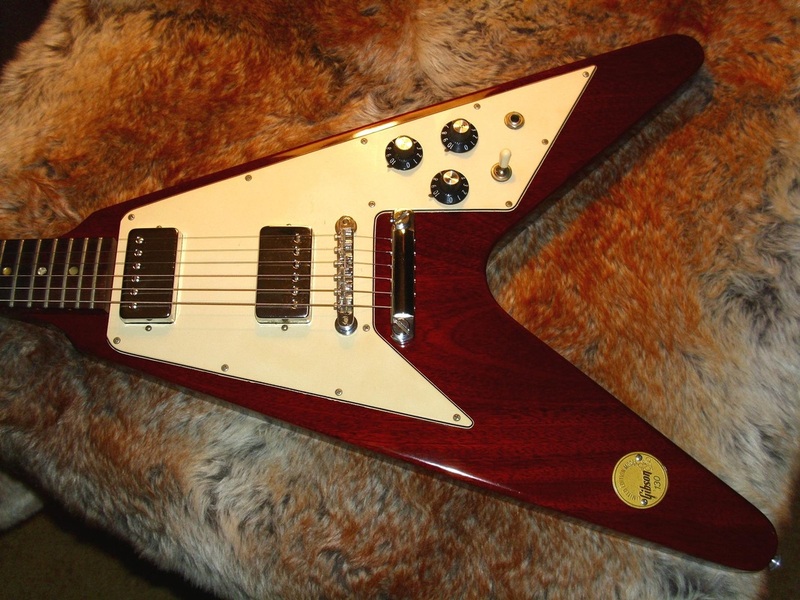 129 of them are pictured on this website (see below).﻿ All 353 guitars were finished cherry. 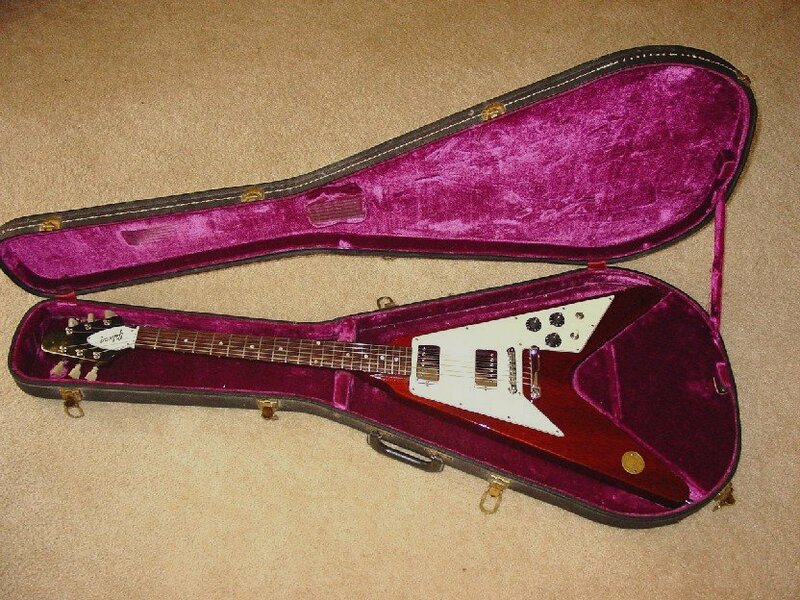 It was rumored that a few were finished in sunburst, but none have ever surfaced. 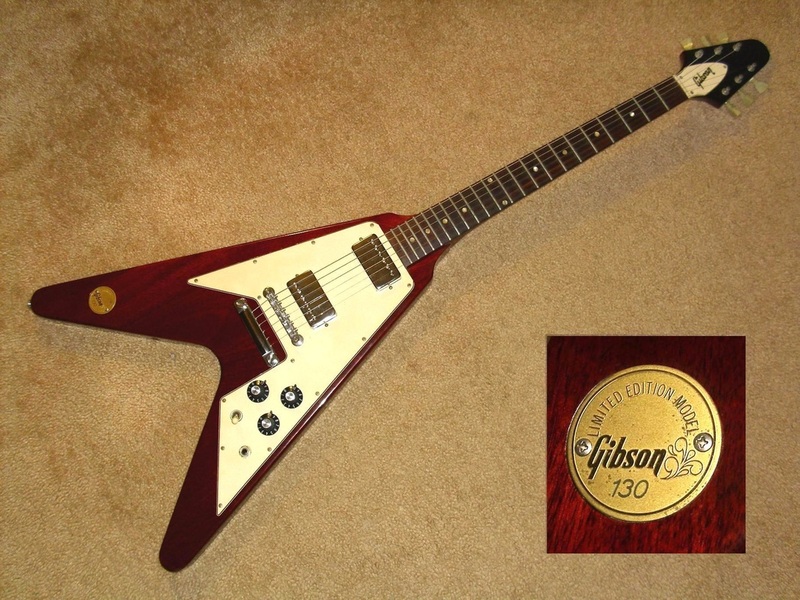 It was also rumored by more than one Gibson employee that there were gaps in the Medallion V production quantities, meaning that far less than 353 were produced. This is possible since only 133 have surfaced in the past 20 years. Of those 133 only 24 are "survivors," meaning they are still 100% factory original, unmolested and unbroken. 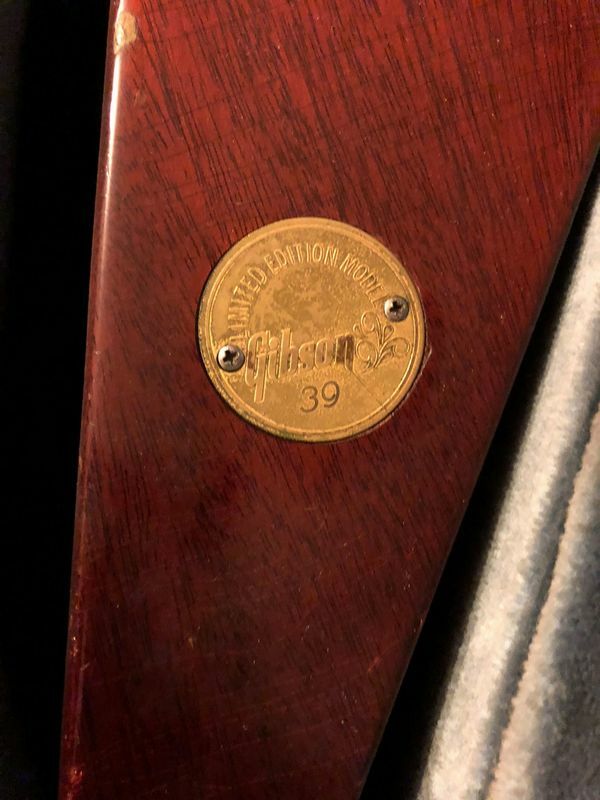 The bodies and necks on the Medallion Flying Vs were made out of mahogany and the fret boards were made out of rosewood. The bodies were two-piece with a center seam while the necks were three-piece. The nut width was 1 9/16 inches. 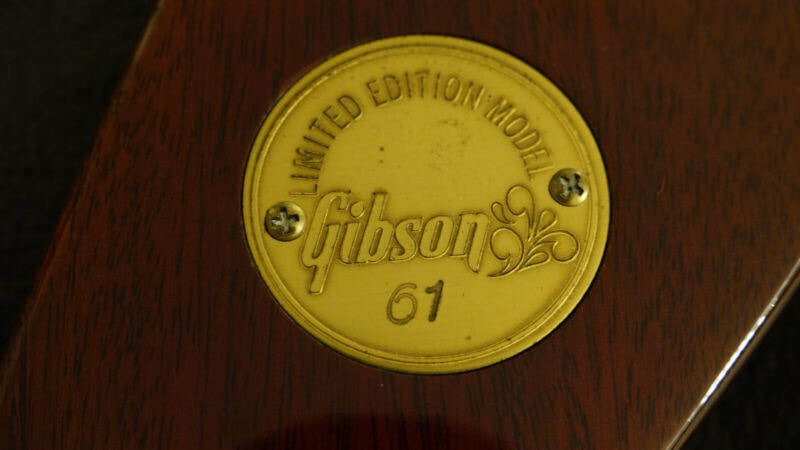 The tuners were Gibson Deluxe double-ring tuners. 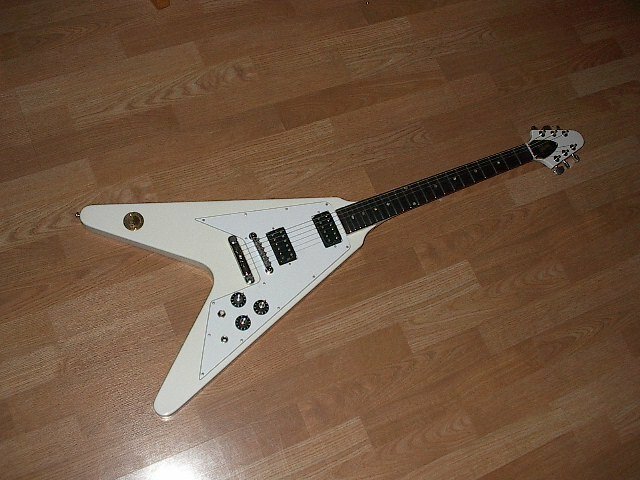 The humbucking pickups had the PAT number decal stickers on the bottom. 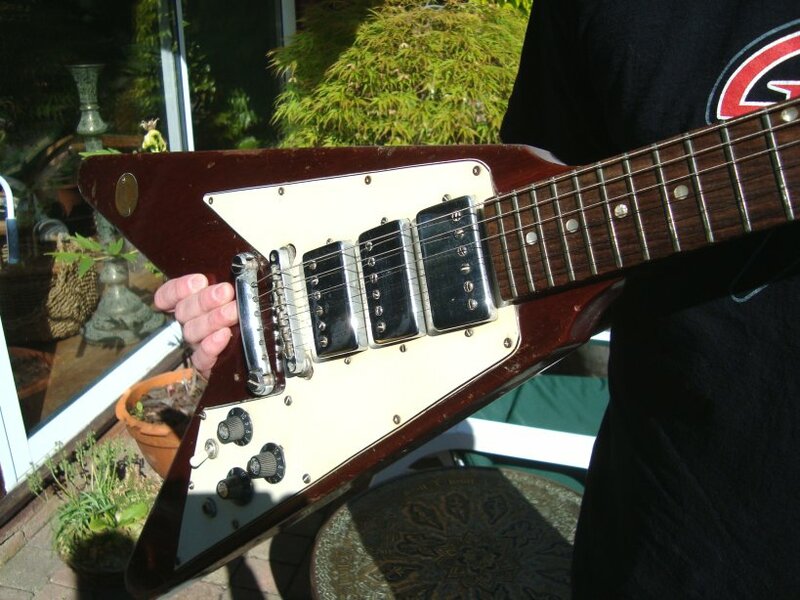 All of the hardware including the ABR-1 bridge, Stop bar tailpiece and pickup covers were chrome. 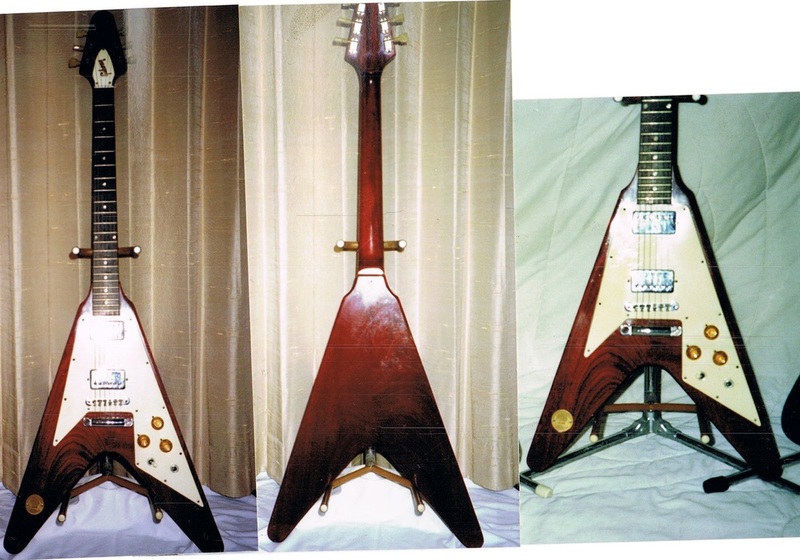 The pickguards were all 3-ply plastic while the truss rod covers were all 4-ply plastic. 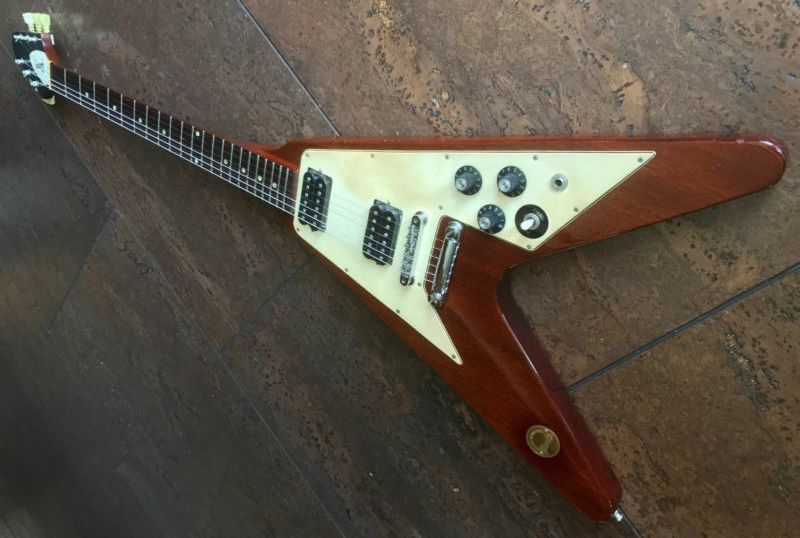 Additional detailed pictures and information about the case, pickups, pickguard, electronics, hardware and body wood routes, etc is below. 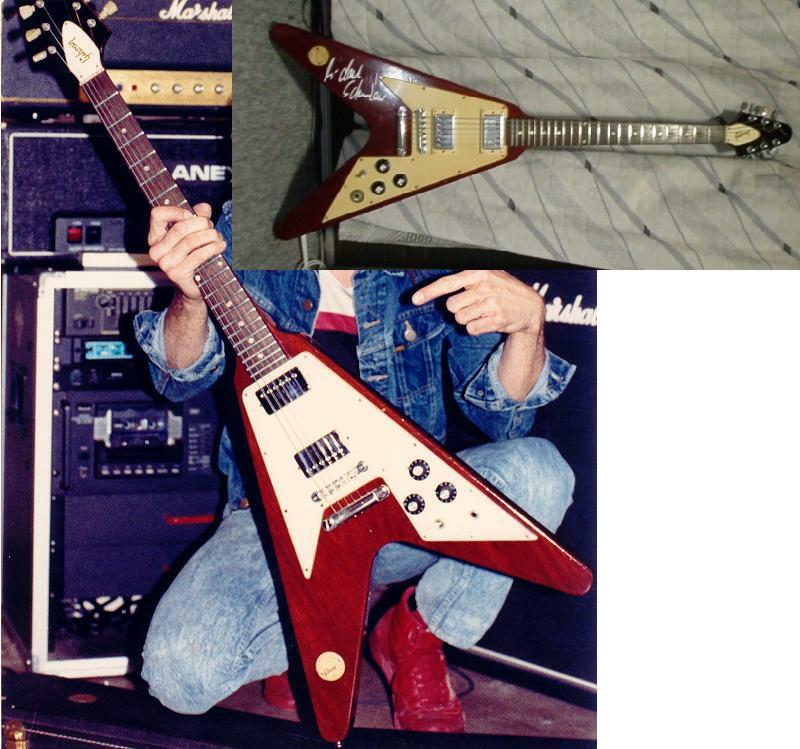 Most of the Flying V Medallion guitars have been significantly modified, refinished, broken or repaired. Some have been trashed and thrown away over the years and are now lost forever. 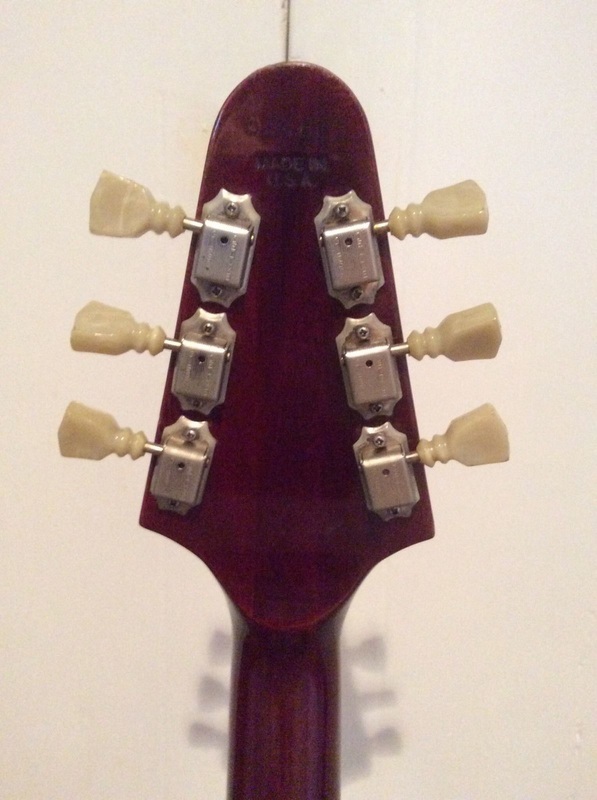 The most common mod was to swap out the tuners with Grover or Schaller tuners. 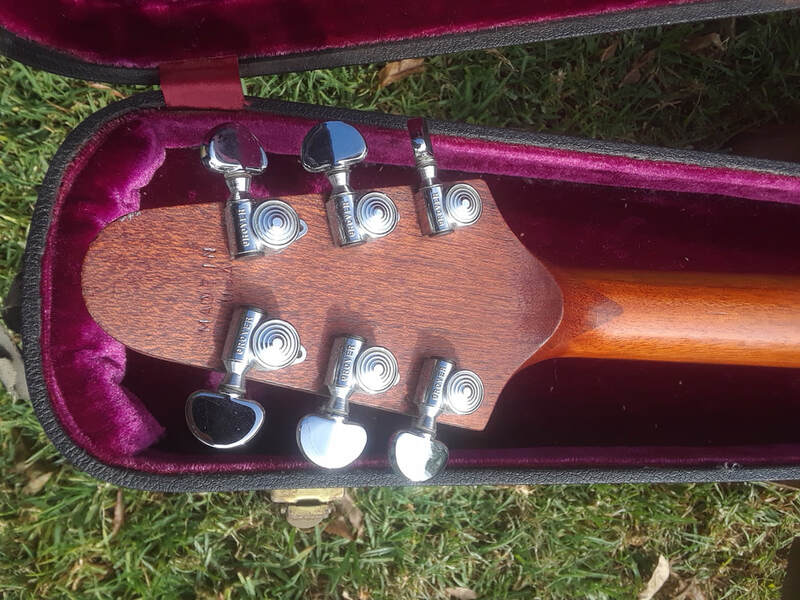 By doing so, the tuner holes had to be bored-out or additional screw holes had to be drilled into the back of the headstock. 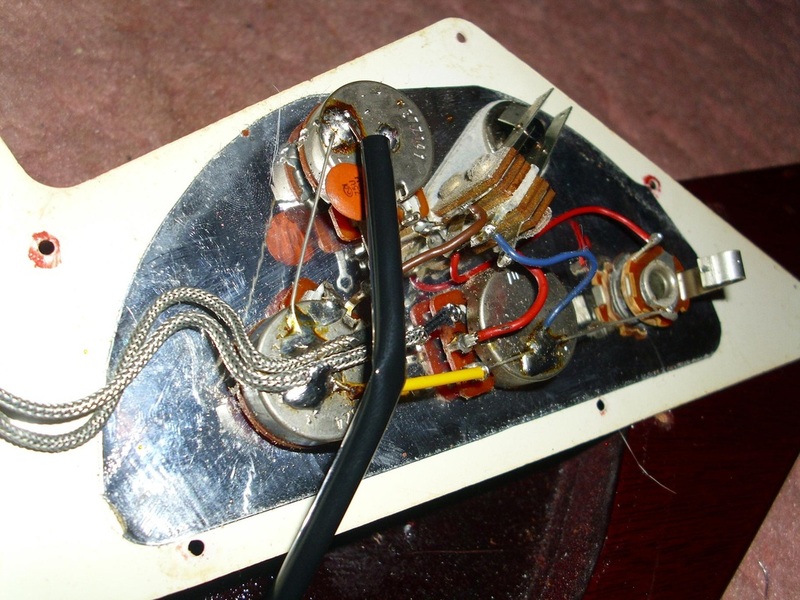 The other common mod was to remove the pickup covers and add pickup mounting rings. As of April 2019,133 Medallion Vs have been accounted for. 24 are Survivors. The Survivors: All original and unmolested: 267, 151, 83, 126, 156, 130, 96, 88, 284, 287, 301, 238, 20, 263, 353, 225, 13, 36, 240, 147, 74, 308, 39, 311. See pictures of all of these Medallions below. The Other Medallions: 6, 10, 14, 16, 18, 21, 22, 25, 28, 29, 30, 37, 38, 41, 53, 54, 55, 56, 57, 61, 63, 65, 66, 68, 69, 70, 71, 73, 76, 78, 79, 87, 91, 95, 98, 105, 108, 110, 111, 118, 119, 120, 122, 124, 131, 132, 140, 145, 148, 150, 155, 158, 160, 162, 166, 169, 172, 173, 177, 178, 180, 186, 187, 188, 194, 197, 200, 208, 209, 210, 211, 212, 213, 218, 223, 224, 228 (stolen), 229, 232, 233, 235, 237, 239, 243, 252, 254, 257, 261, 268, 269, 280, 283, 290, 300, 306, 317, 323, 326, 327, 333, 335, 340, 342, 345, 348, 351, 354* (*case coin that was roughly etched with bogus 354, which does not exist), and four that are coinless, one of which is painted light blue. All of the Medallion Vs in "The Other Medallions" section (here) are featured on this website after "The Survivors". 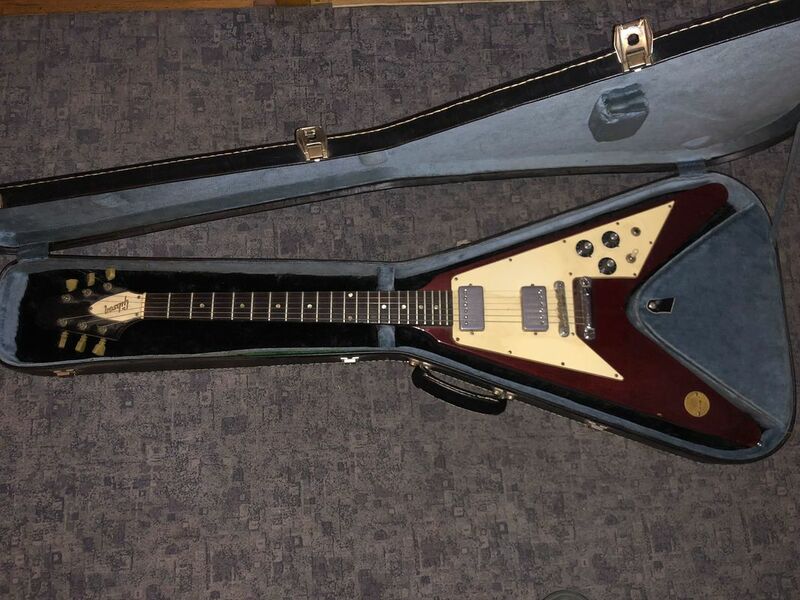 (All original and unmolested, near mint. Sold by the original owner to your web host in 2002). 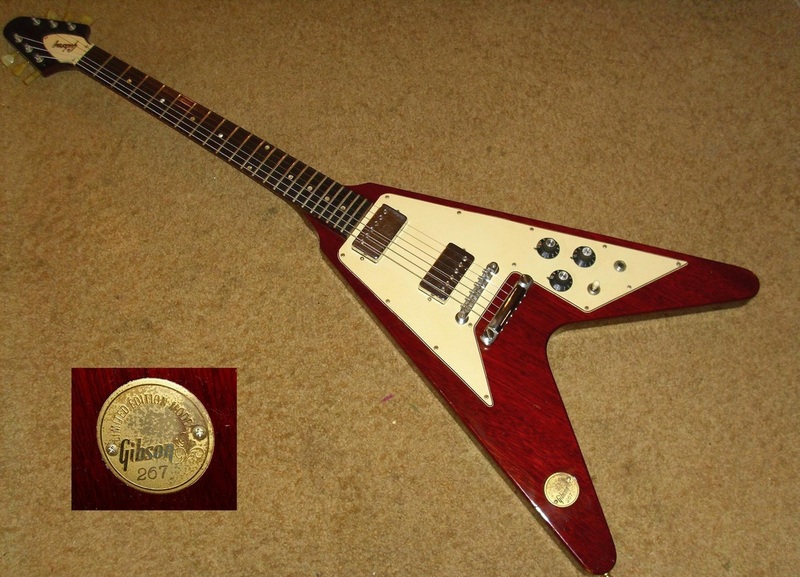 This is the cleanest Flying V Medallion I have ever seen. What a beauty ! This one is a lifetime keeper ! (All original and unmolested, except the pickup covers were removed). Still in possession of the original owner. 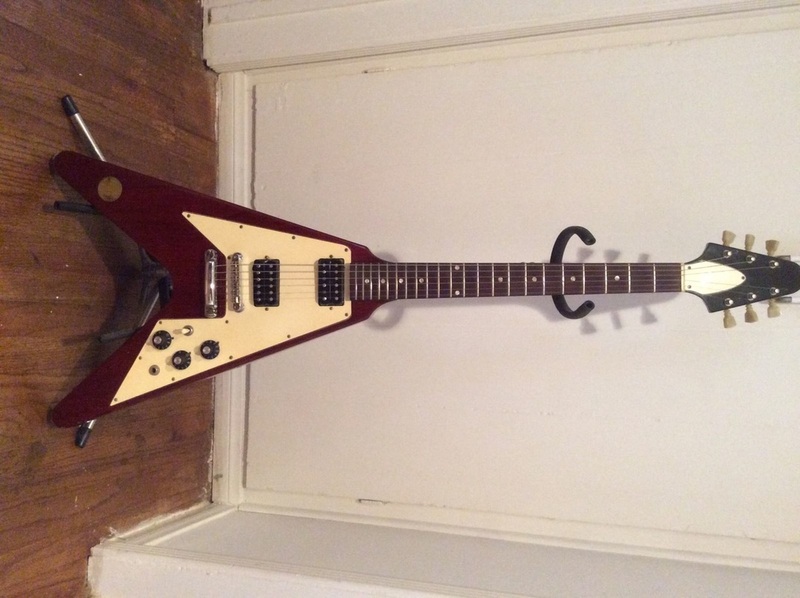 (A little rough, but it is still all original and totally unmolested). 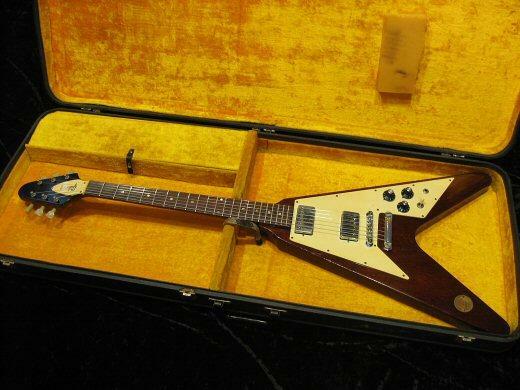 Purchased by a collector in Switzerland from the original owner in 2008. All original and totally unmolested. 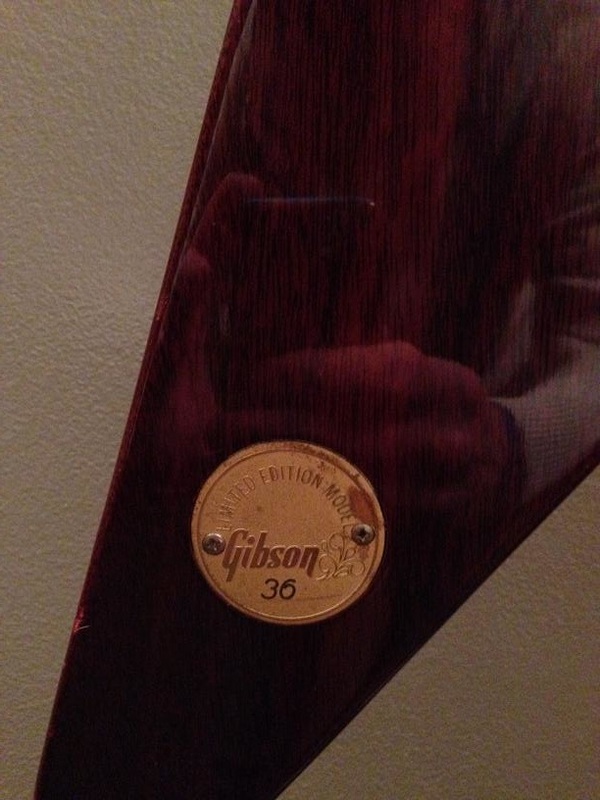 Note: Medallions #351, 352 and 353 were all sold by the same Gibson dealership store. All original and totally unmolested, exceptionally clean. All original and unmolested. Pickup covers were removed and the nut was changed (Still qualifies as unmolested in my book). 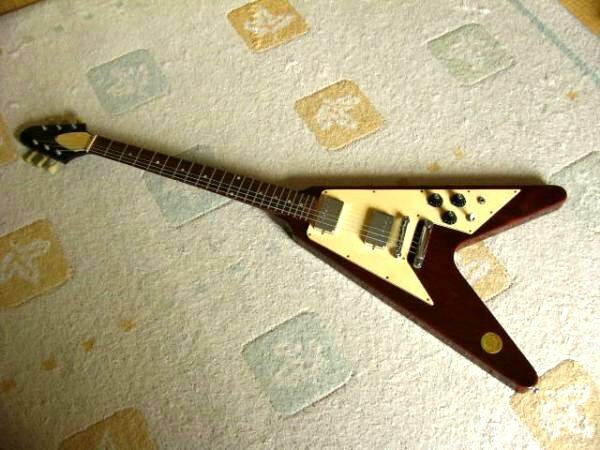 As of the early 2000's this Flying V was still totally original and unmolested, with the exception of the added gold knobs. 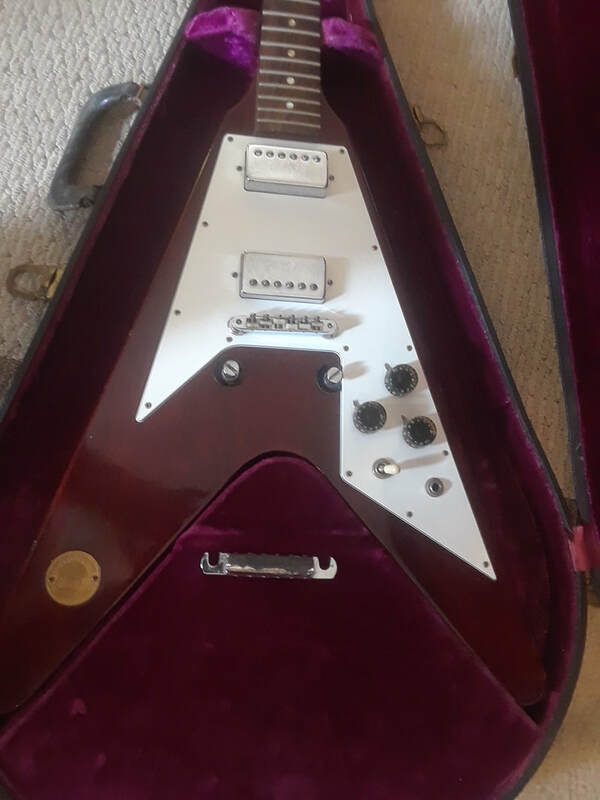 It has a 6 inch gash on the neck from when a symbal fell over and hit the guitar. 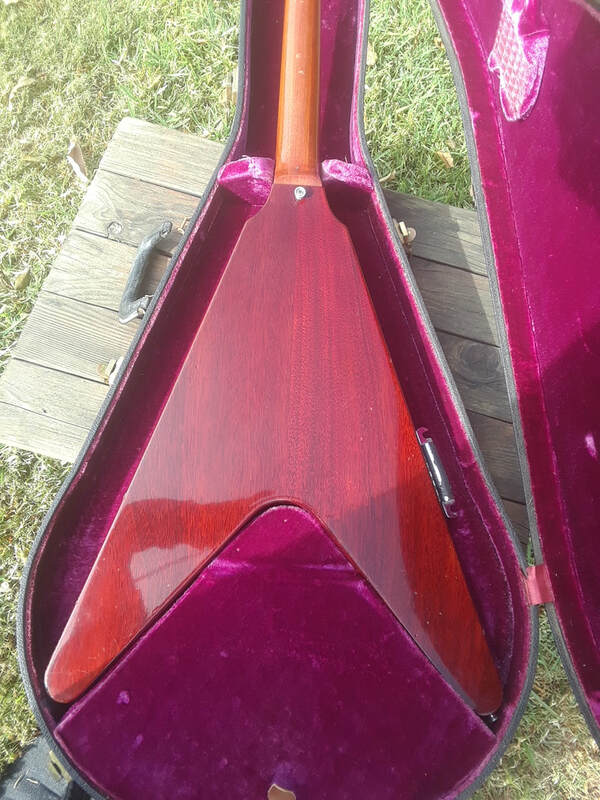 The guitar was sold in early 2000's. Thanks Scot. Posted June 2016. All original and totally unmolested. This is one of the cleanest Medallion Vs on the planet. The current owner bought it from the original owner in 2014. 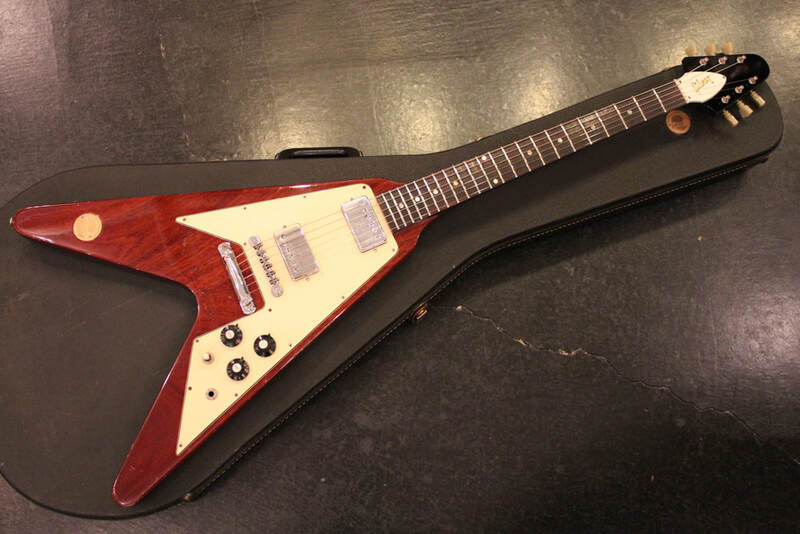 According to the current owner this V is in nearly unplayed condition. Thanks Kim. Posted Nov. 2016. All original and totally unmolested. 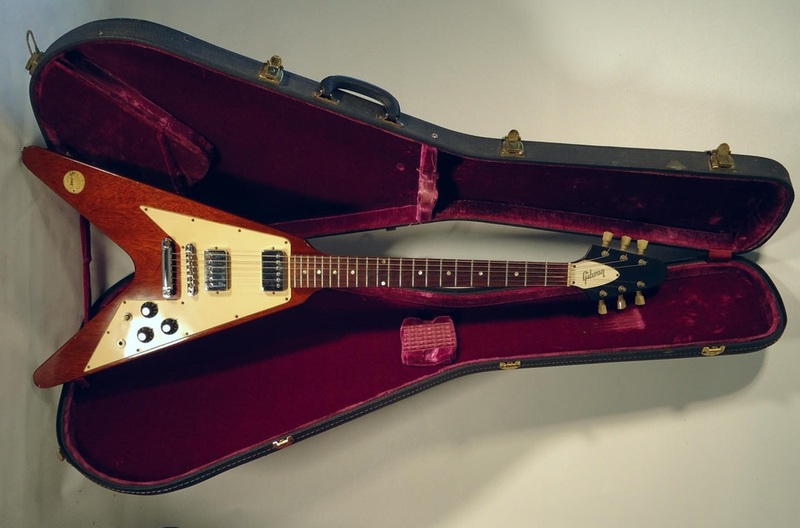 The second owner of this V, Slobodan Bodo Kovacevic, purchased it in London, England in 1975. 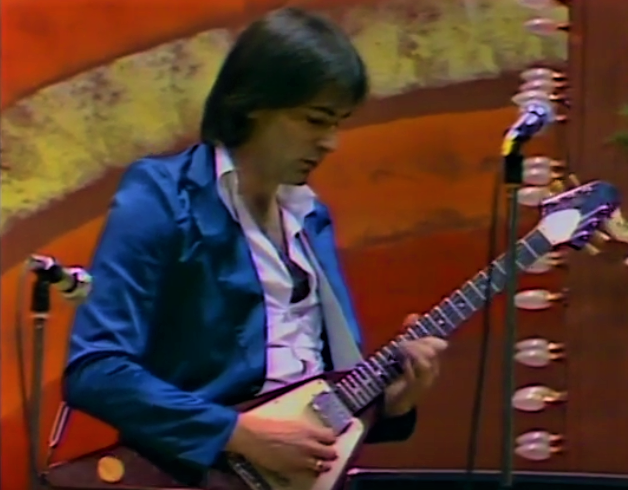 Slobodan was a famous guitarist from Yugoslavia and Sarajevo that passed away in 2004. 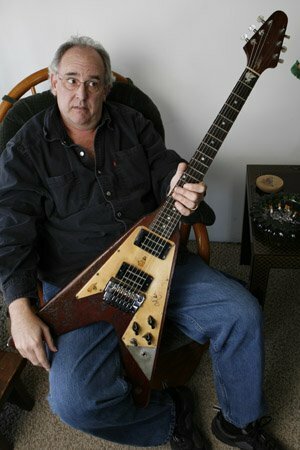 The guitar is still in the possession of the Kovacevic family. The original case is missing but so what. Posted September, 2018. Thanks Dusan. Pictured below: Slobodan Bodo Kovacevic playing Medallion V #39. 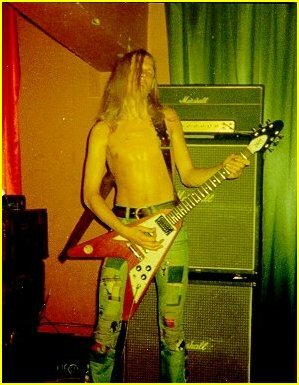 This picture was most-likely taken in the 1980s. 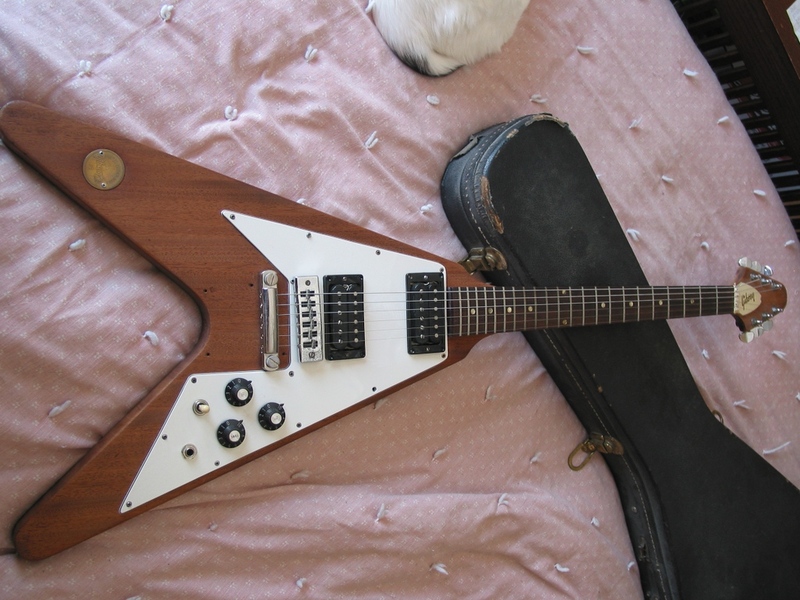 ​All original and totally unmolested. 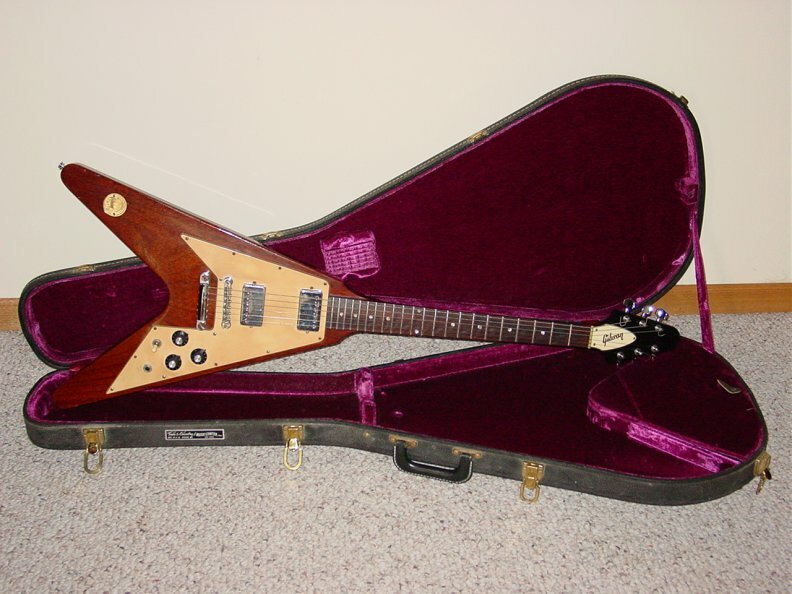 As you can see, this incredible guitar is near mint with only a few dings. Posted October, 2018. 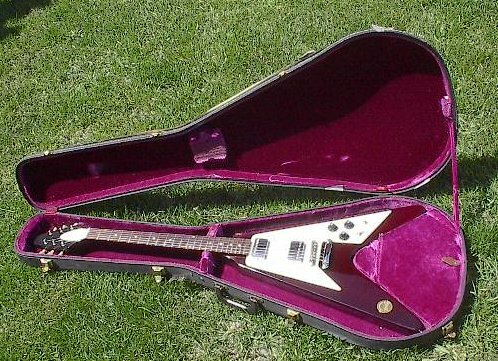 The unmistakable Medallion Flying V case. 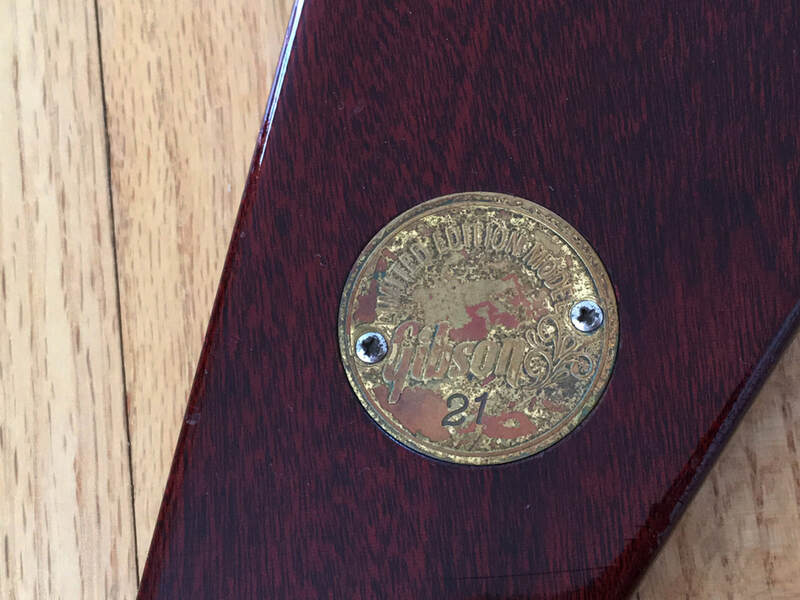 Each case had a Medallion coin affixed to the top of the case. 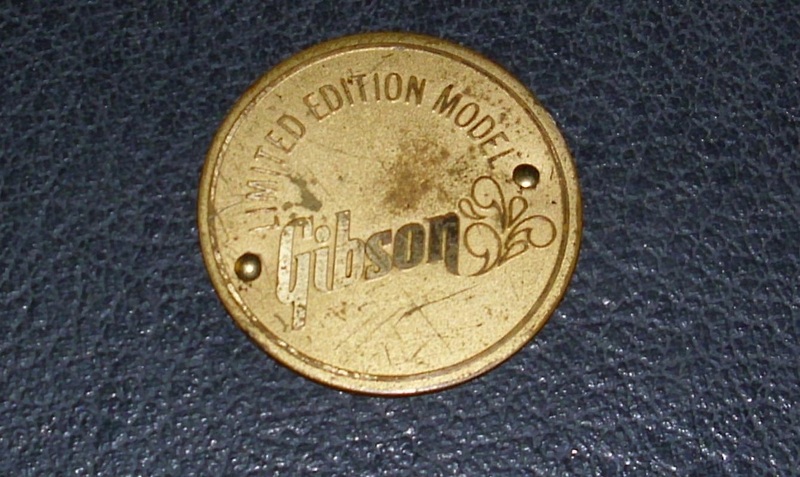 Close up view of the case medallion coin. 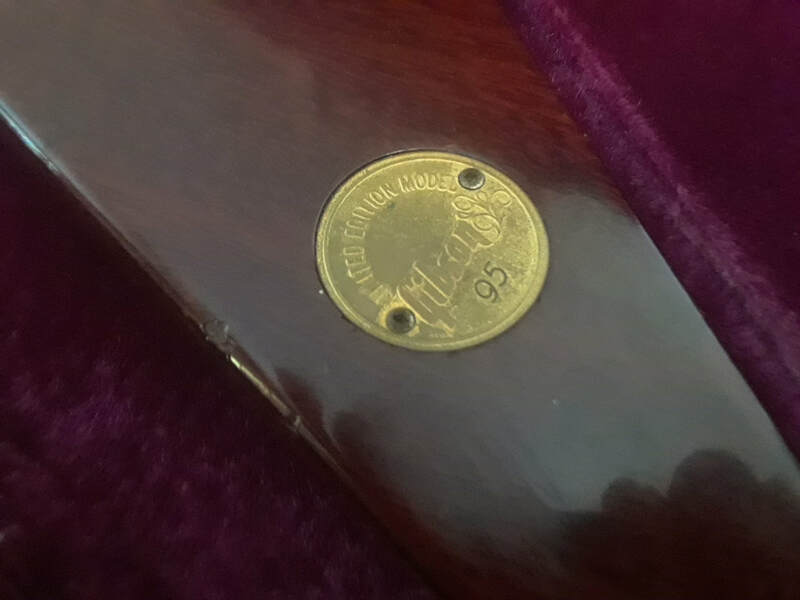 The case coins were identical to the coins used on the guitars except they were not etched with the guitar number. Close up view of the pots and other electronics. Notice the black ground wire tubing shield. Some Medallions had this protective shield for the ground wire, some had a single bare wire, some had a double bare wire and some had a coated wire. Close up view of the PAT # sticker pickups and QA stamp. 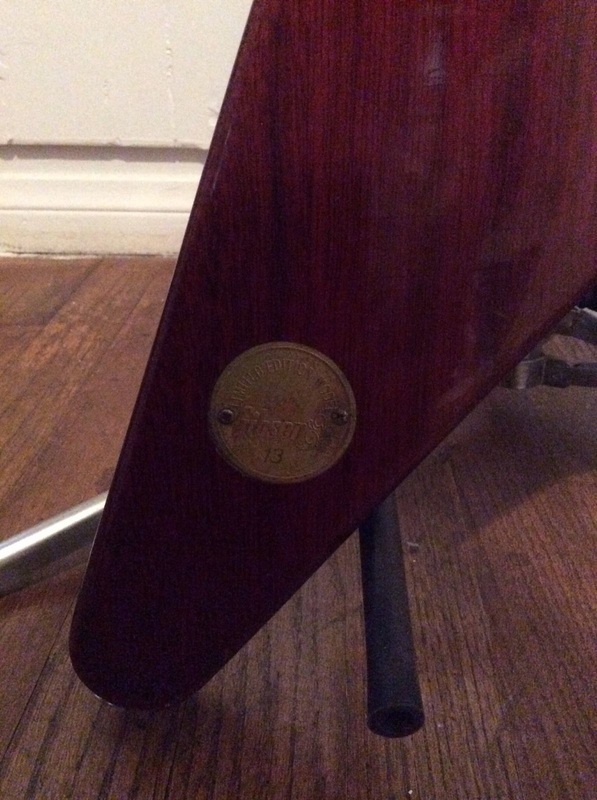 All Medallion V pickguards have this QA stamp. 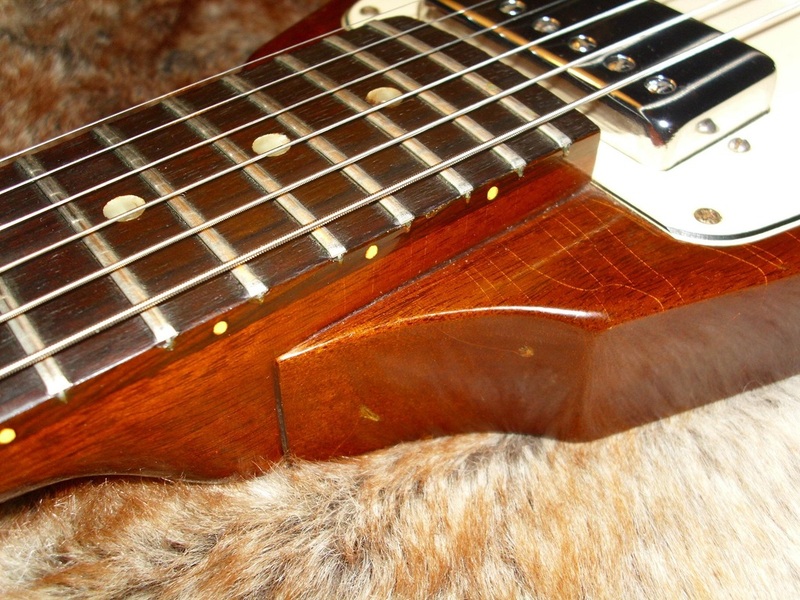 Close up view of the neck tenon hump and neck joint. 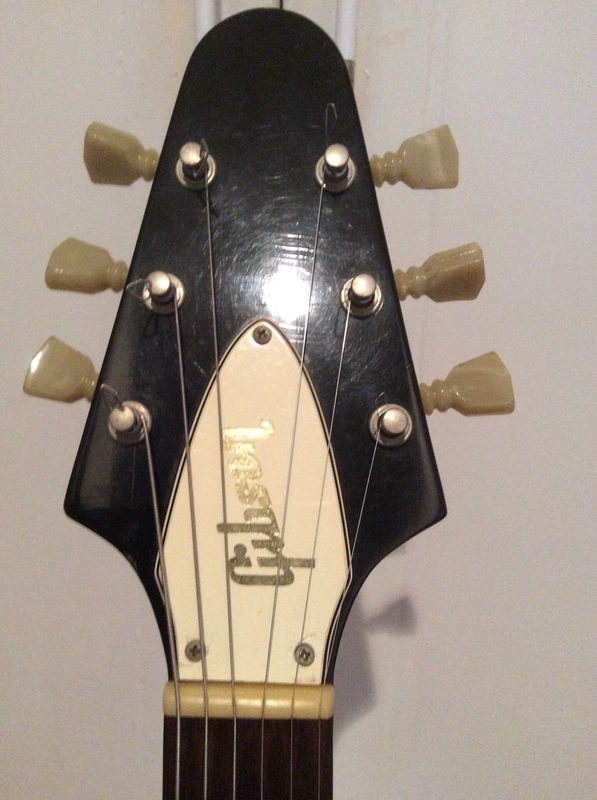 Close up view of headstock (front). 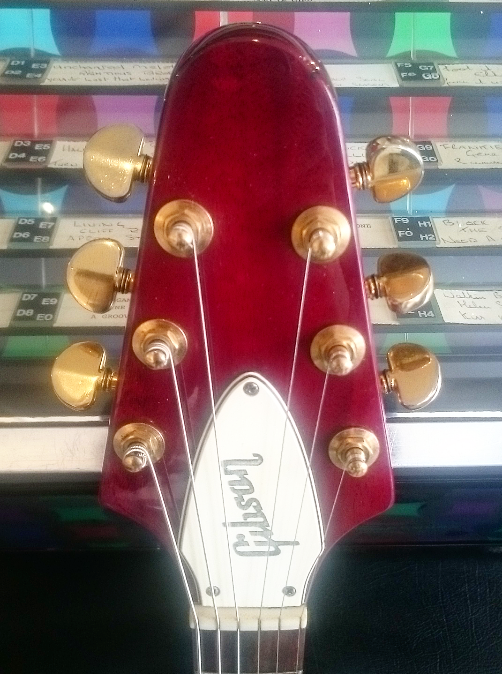 Close up view of headstock (back). 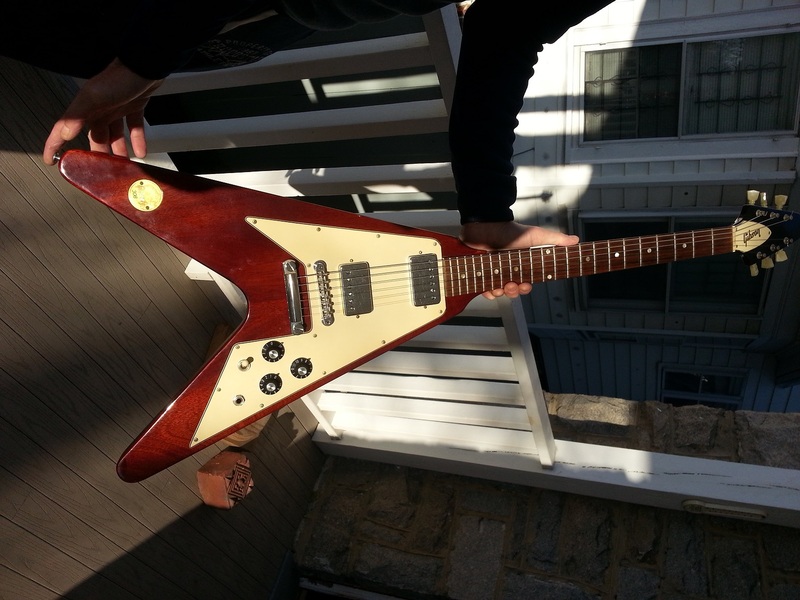 Flying V Medallion #6 (Shaved off volute due to headstock break and subsequent repair. Schaller tuners added. Pickguard replaced with late 1970's pickguard, strap button added to upper wing, Gibson embossed pickup covers installed. 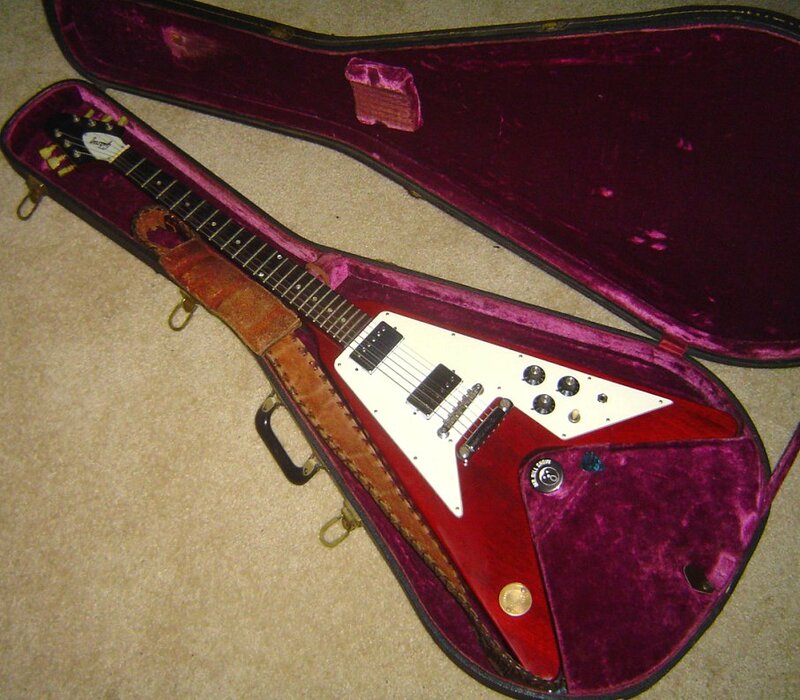 Flying V Medallion #21 (Harmonica bridge added in the 1970's. 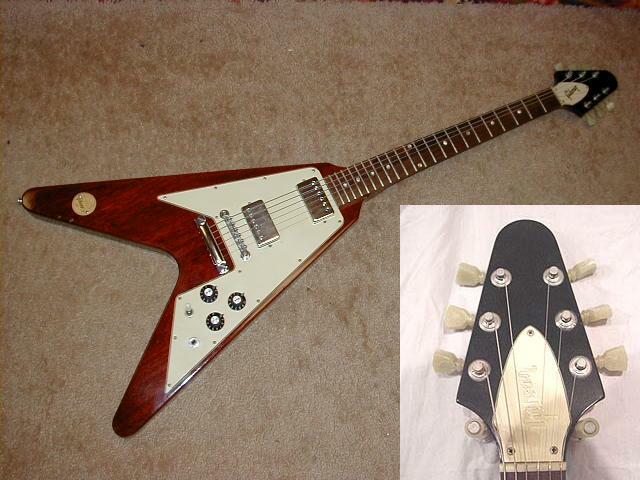 Also, has non-original Schaller tuners and broken corners on the pickguard). Added Feb. 2018. Thanks Scotty. 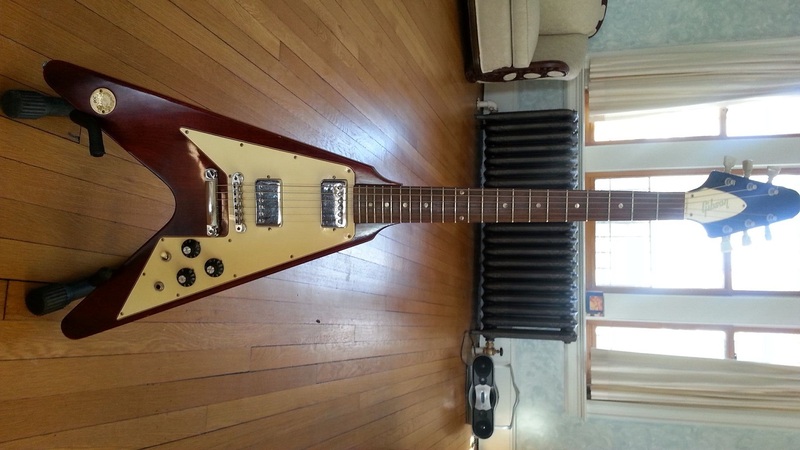 Flying V Medallion #54 (Schaller tuners installed, late 60's Maestro Vibrola installed. These changes were done prior to 1977. The pictures below were taken around 1977. 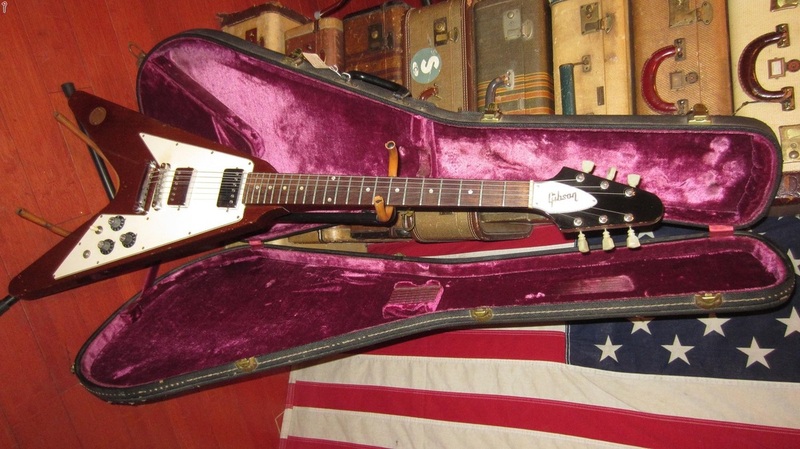 The guitar was sold soon after that and has not surfaced since. Posted March 2018. Thanks Roger. 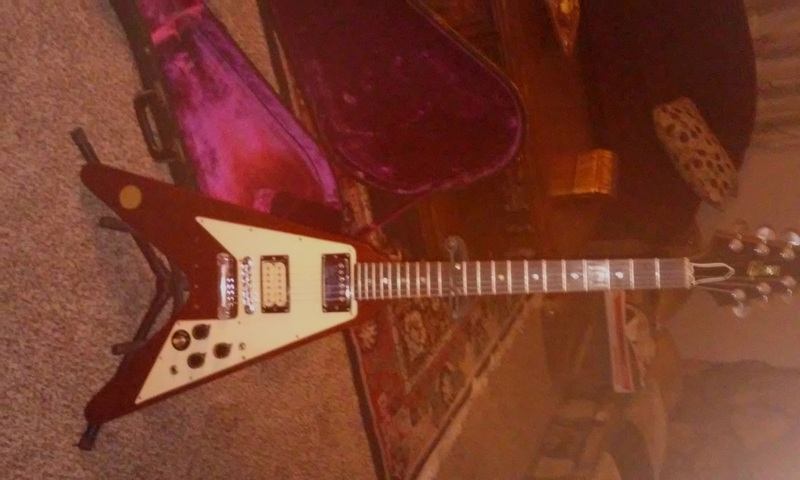 Flying V Medallion #55 (Grover tuners installed then later replaced with original era Gibson tuners and newer flat bushings). 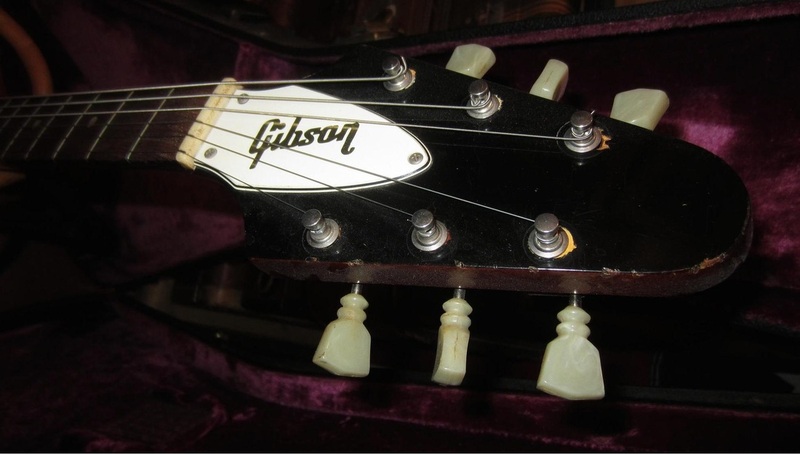 Notice the Grover tuner remnant marks on the front of the headstock (chipped paint and circular bushing imprints). 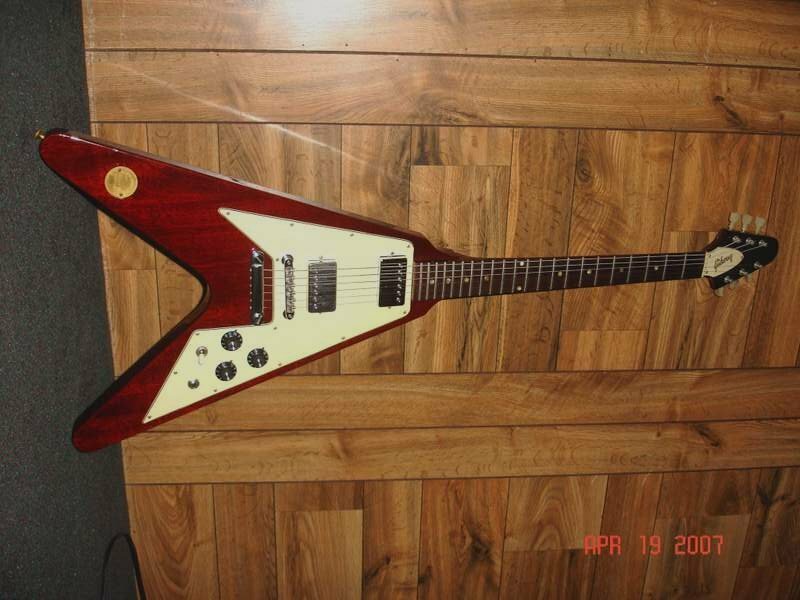 Also has missing corner on pickguard and headstock crack). 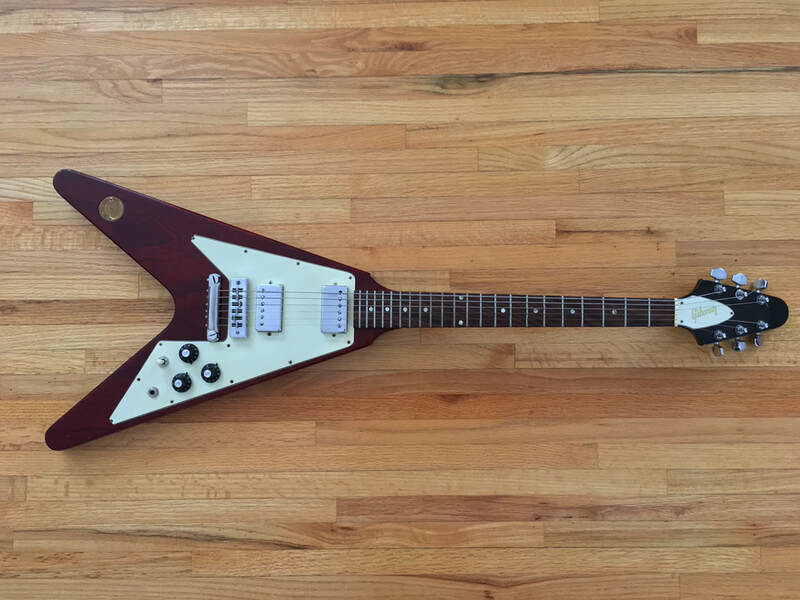 This guitar was sold on e-bay in March 2015. The Grover marks had been touched-up at that time. 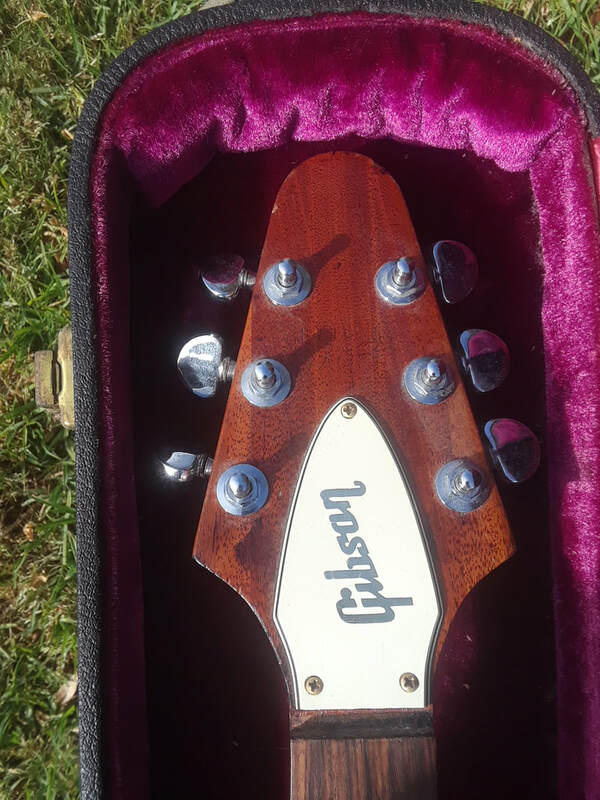 See pictures and web link below that show the headstock before it was touched-up. Posted February 2015. 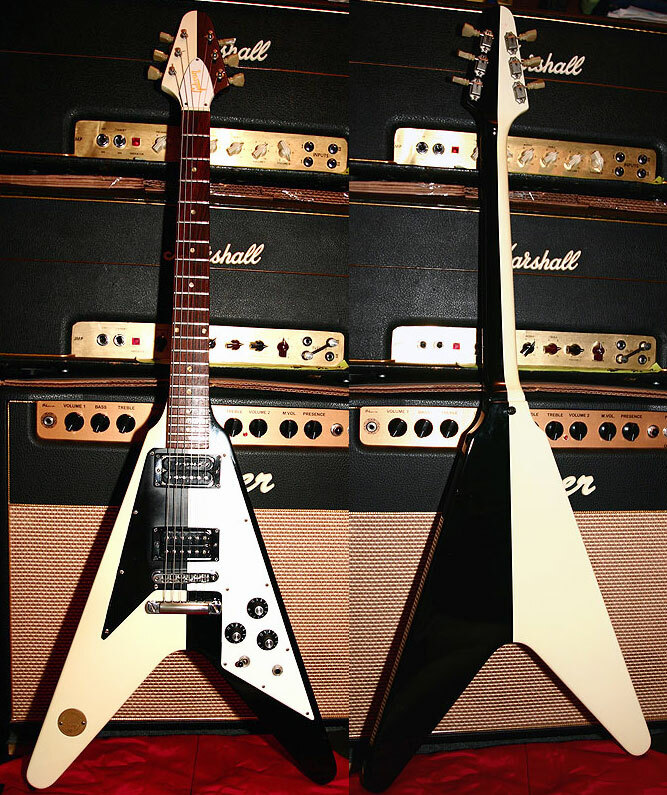 Flying V Medallion #56 (This is the famous Medallion Flying V that Michael Schenker used on the first 3 or 4 UFO albums. 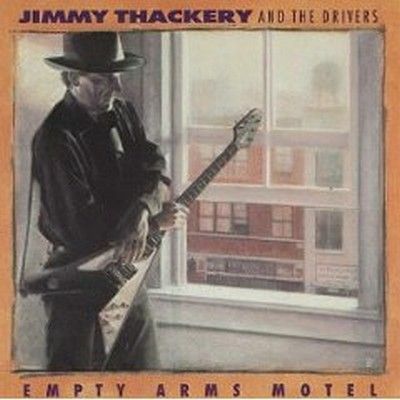 He is pictured on the back of the "Force It" album playing this guitar. In the mid 70's Michael had it painted black, then white then it disappeared. It surfaced about 15 years ago and had been refinished to the black and white flip flop color combination that he started using in 1979. 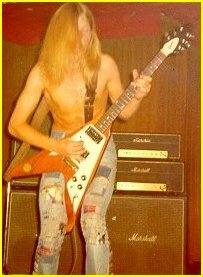 No one is really sure if this guitar was actually painted in the black and white flip flop combination way back in 1979 or not. 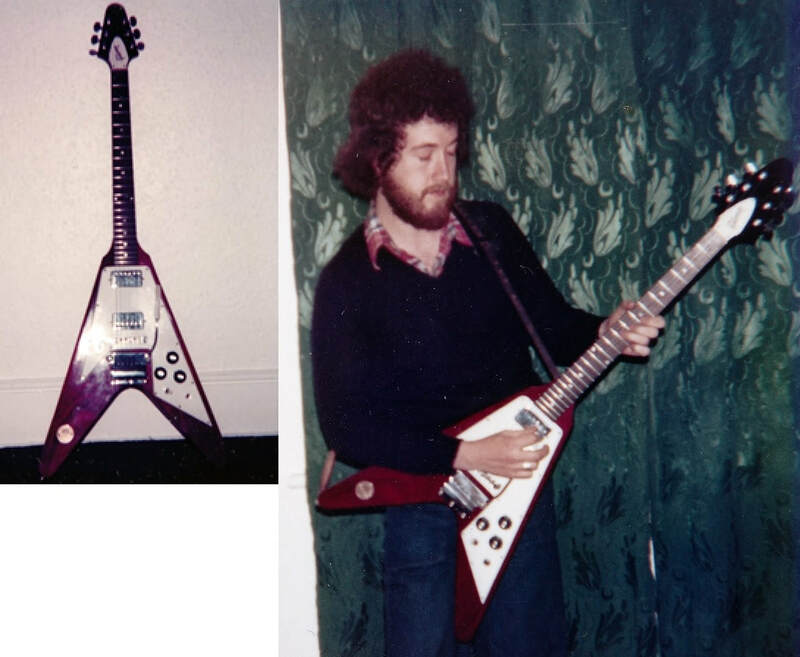 He had a 75 Flying V that had the black and white flip flop combination. It is said that he got the idea for the black and white flip flop color combination from the German V-2 rocket. 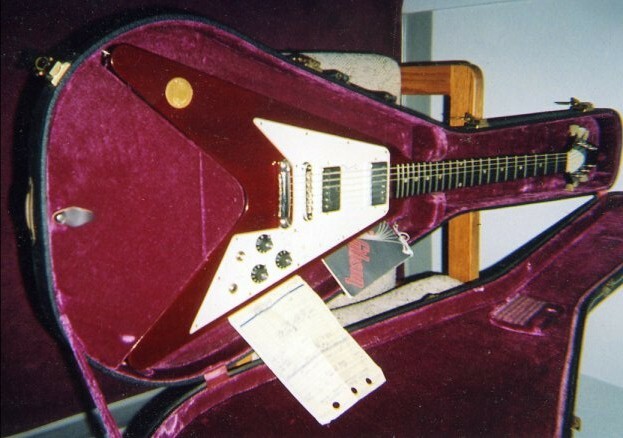 Michael originally borrowed this guitar from his brother Rudolph in 1973 and never returned it. 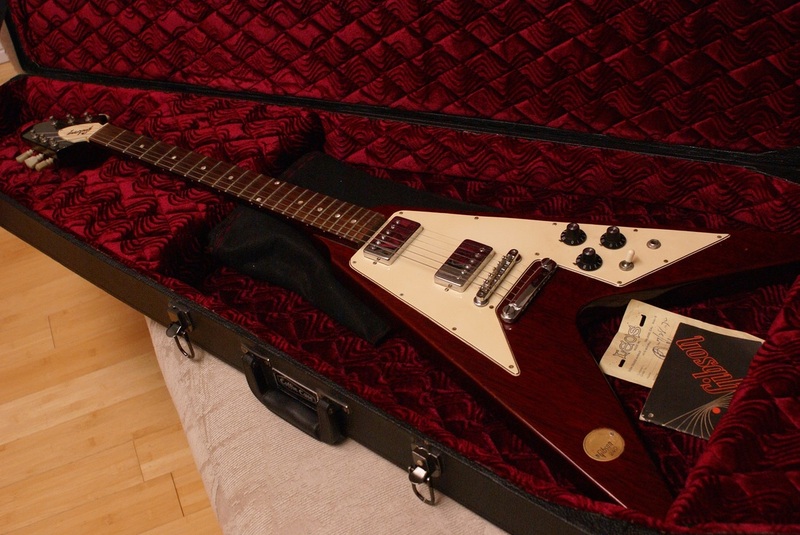 Flying V Medallion #57 This one has added pickup rings, added mid-70's harmonica bridge and Schaller tuners. Thanks James. Added July, 2015. 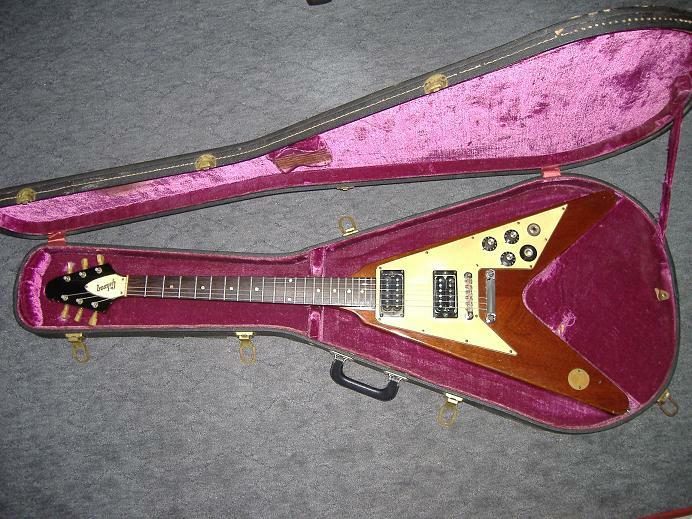 Flying V Medallion #65 (Headstock repair, knobs changed to gold top hats). Added April, 2017. Thanks Buddy. 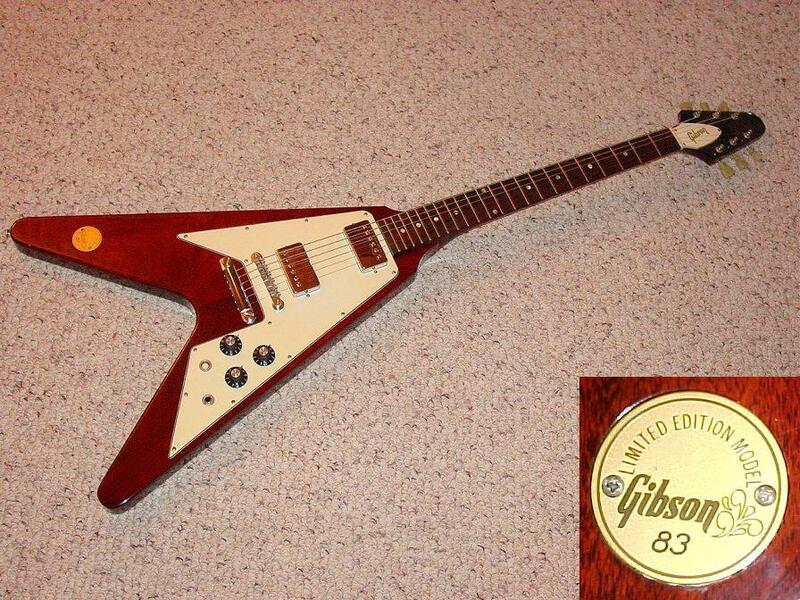 Flying V Medallion #66 (Grover tuners added then later replaced with original Gibson Deluxe tuners). 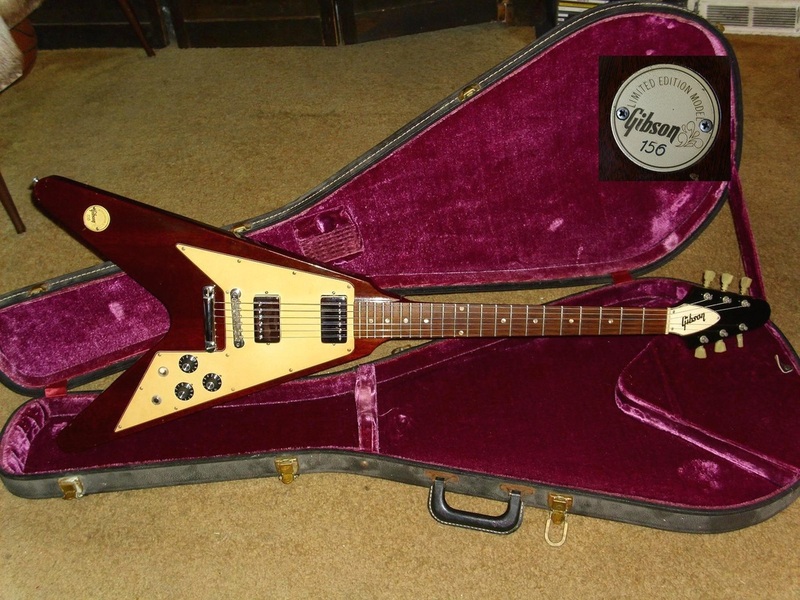 This guitar was sold by Heritage Auction House in 2012. 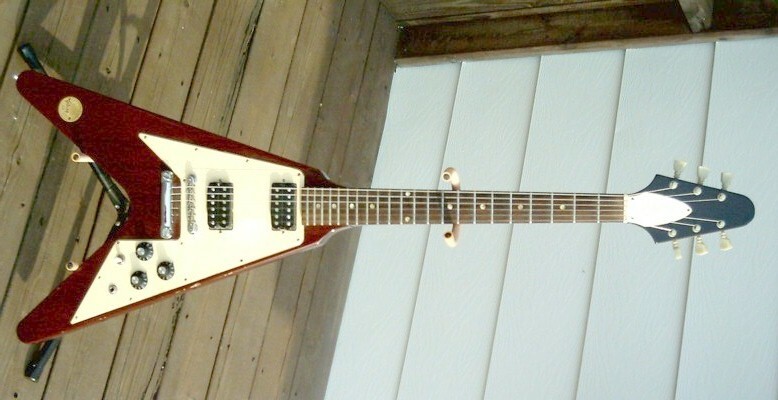 Flying V Medallion #70 This one was refinished with a lighter shade of cherry. 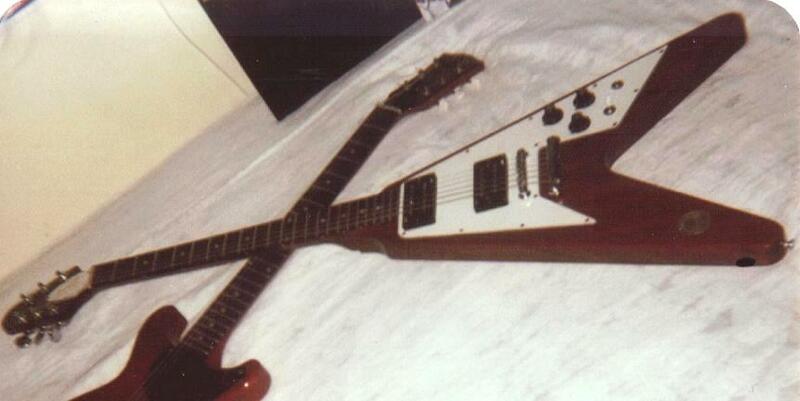 The headstock was also refinished the same color. Pickup rings added, gold hardware added, Grovers added. Posted Nov. 2016 (dealer photos). New information as of September 2018: #70 has been purchased and has now been partially restored. See new picture below. Thanks Garth. 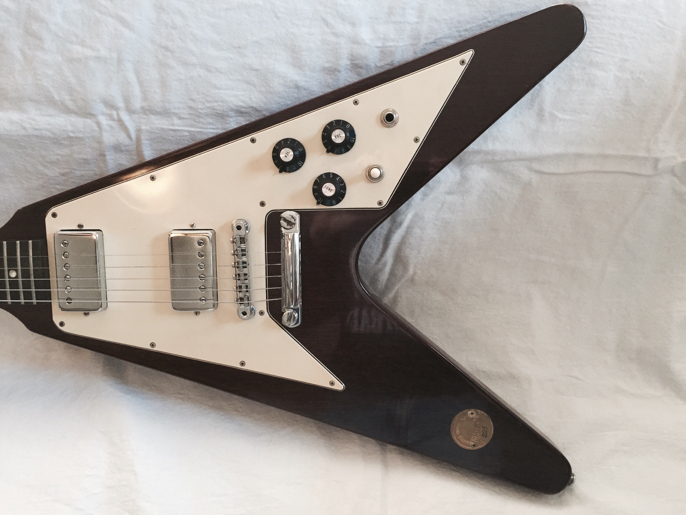 Updates to #70 as of September 2018: The headstock has now been refinished black, original tuners added, replacement guard installed and the gold hardware removed. 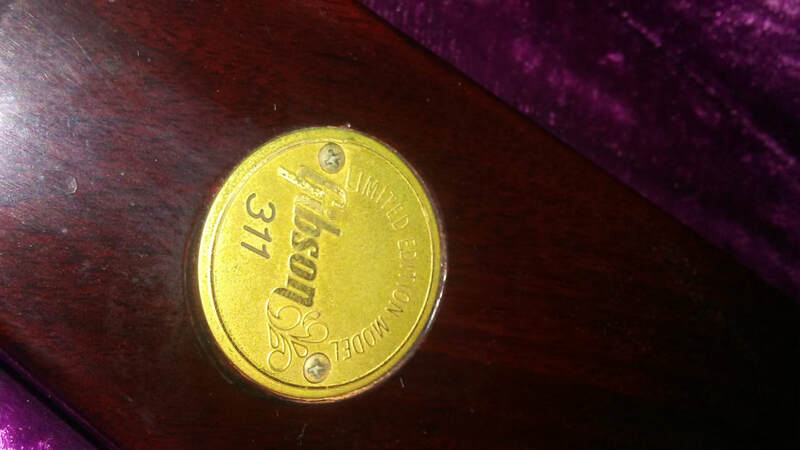 Note: There is also a fake burgundy Medallion with a 71 coin that was built in Japan. 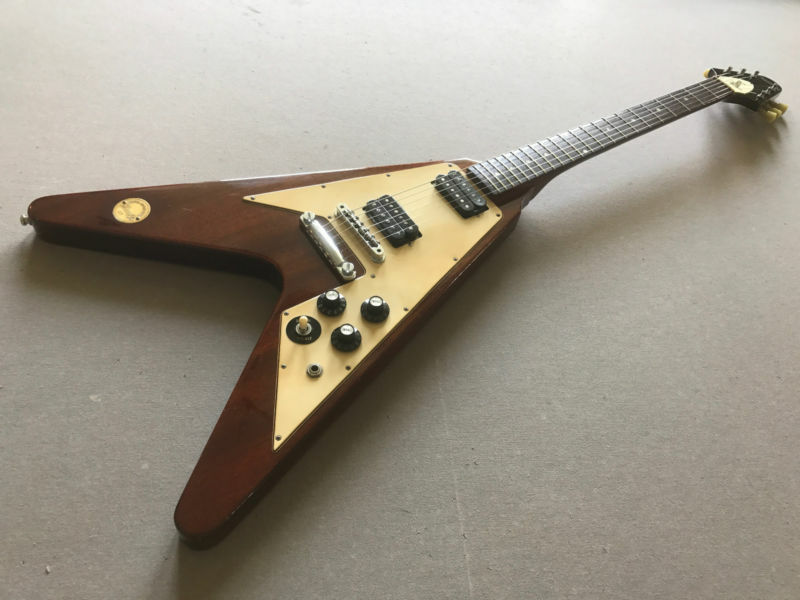 Flying V Medallion #78 (Cracked headstock, four additional strap buttons added, pickup mounting rings added, support washer added at input jack). 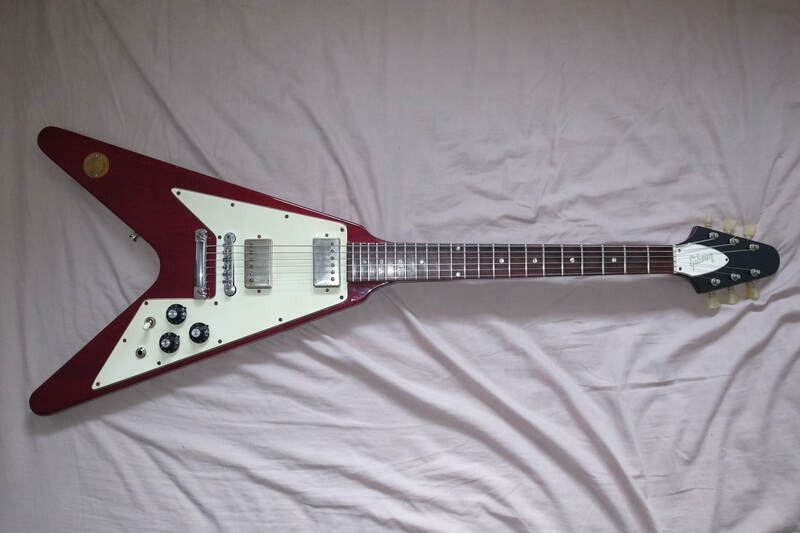 This guitar recently sold on E-bay in July 2014. 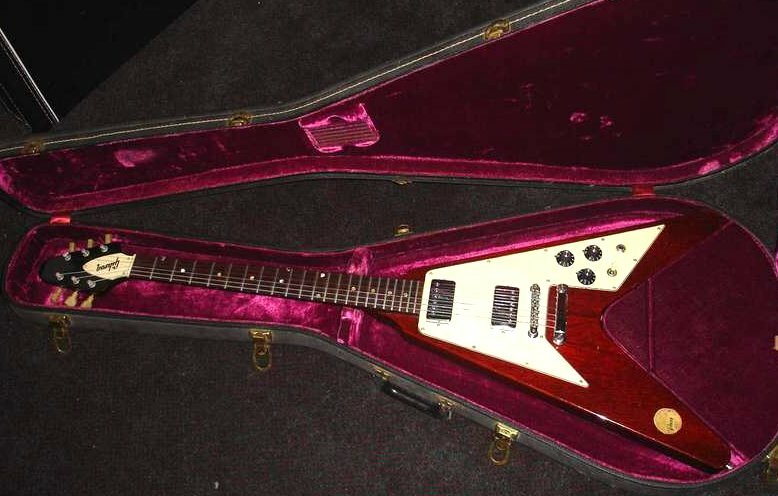 Flying V Medallion #79 (This one is owned by blues guitarist Jimmy Thackery. It has been extensively modified over the years. 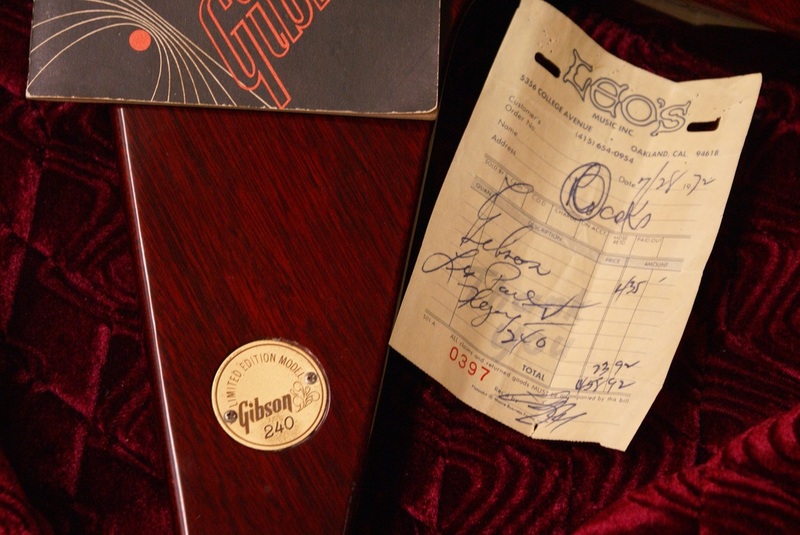 The guitar has been autographed by lots of notable individuals over the years. 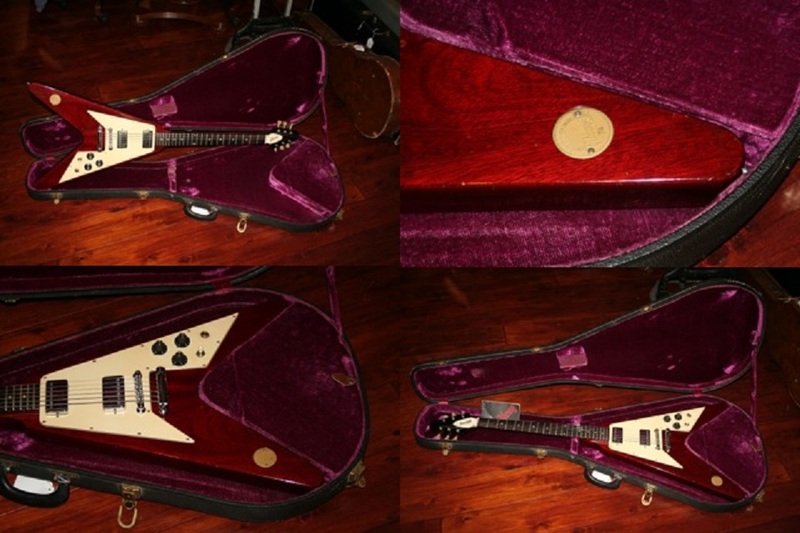 ​Flying V Medallion #95 (thin wood inlay added to back of headstock to hide headstock crack and repairs. 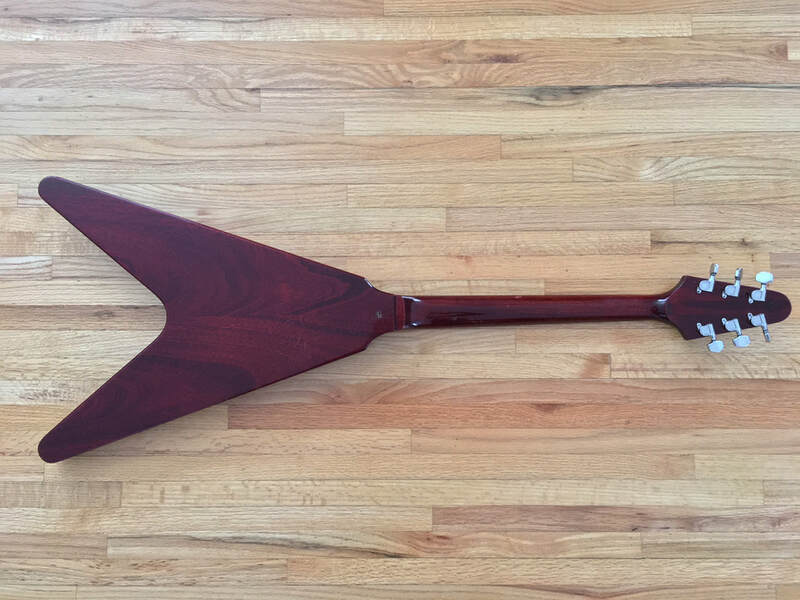 Neck refinished in Natural. 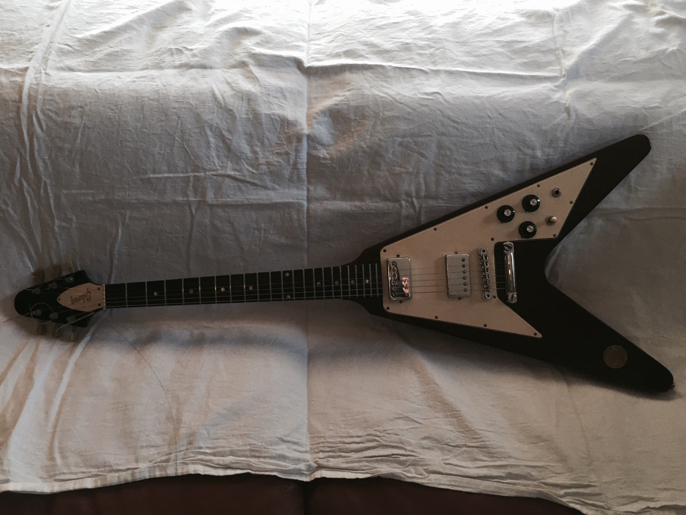 Pickguard replaced. 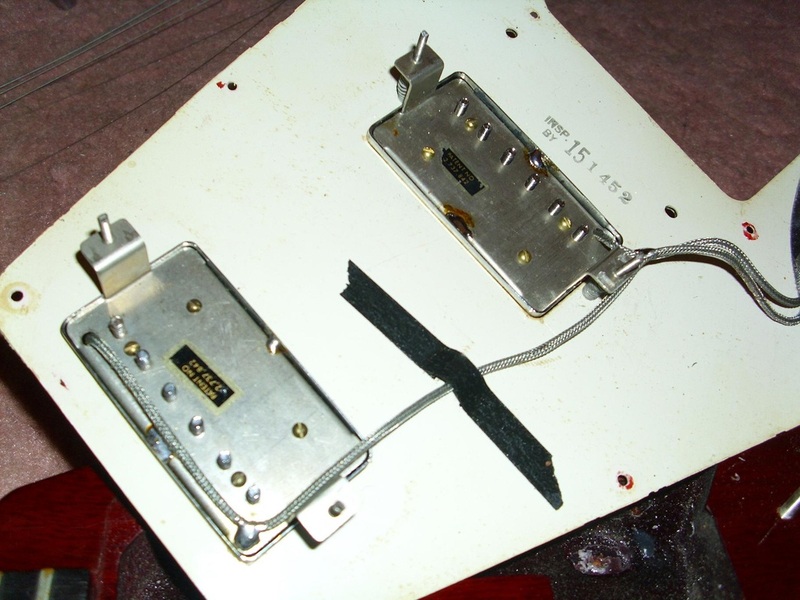 Original pickguard not shown, but it has a hole for a Toggle-tap switch which has now been removed. Crudely re-stamped with Made In USA. 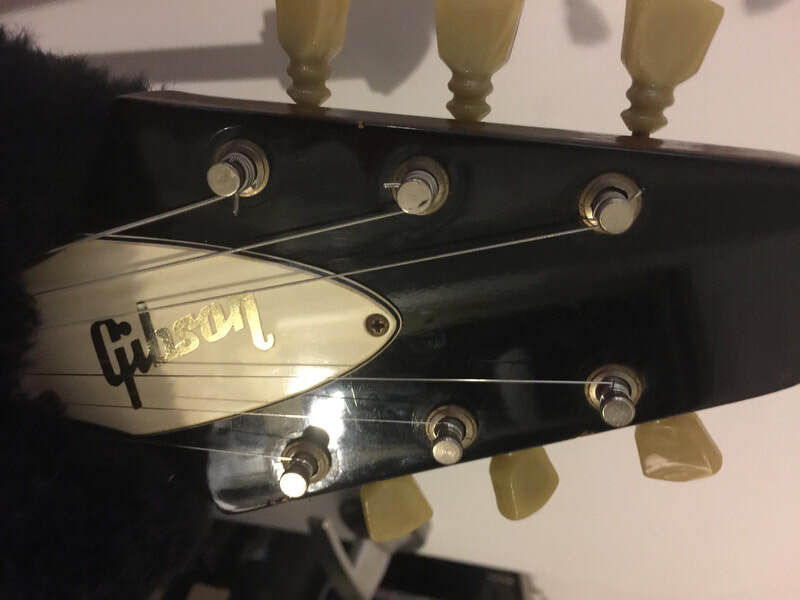 This is one of the few Gibson guitars that has the black plastic beauty rings around the stop bar studs, probably due to damage at the factory. I have seen this before on other models but it is fairly uncommon. Thanks Lee. Posted January 2019. 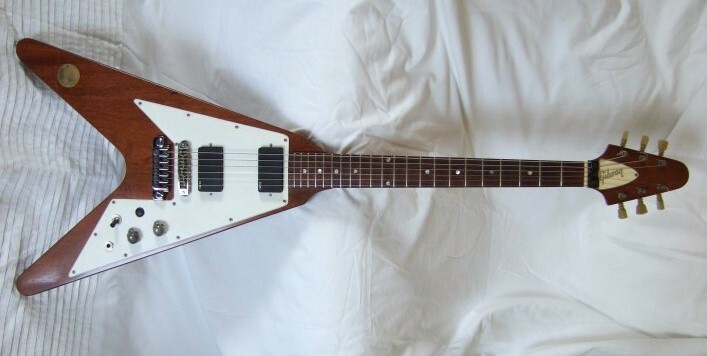 Notice the thin wood inlay on the back of the headstock. There is also a clever repair on the neck side of the volute. 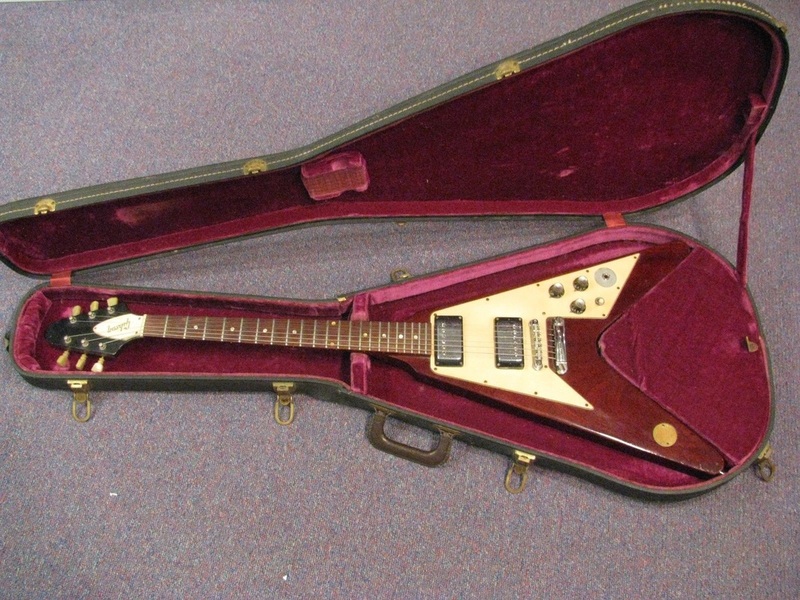 Flying V Medallion #98 (Grover tuners added and pickup covers removed in the 1970s. 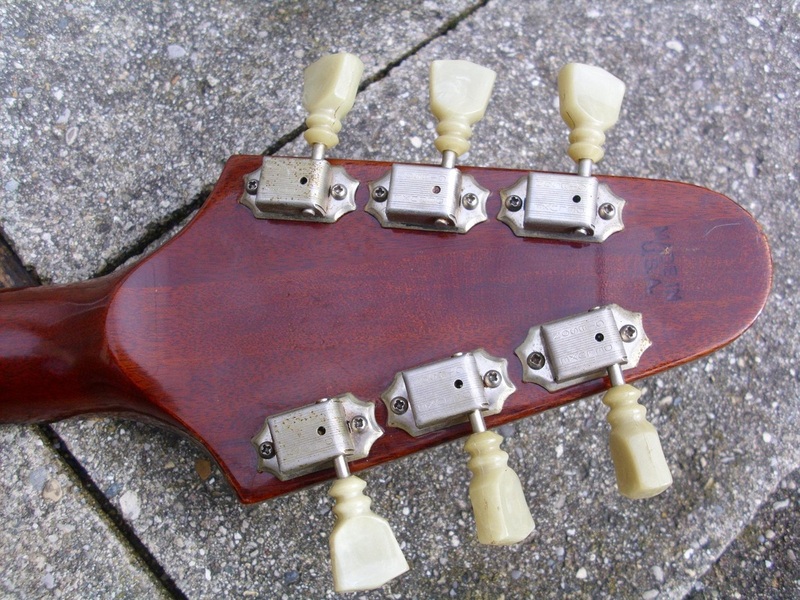 Headstock was also broken and repaired in the 1970s). 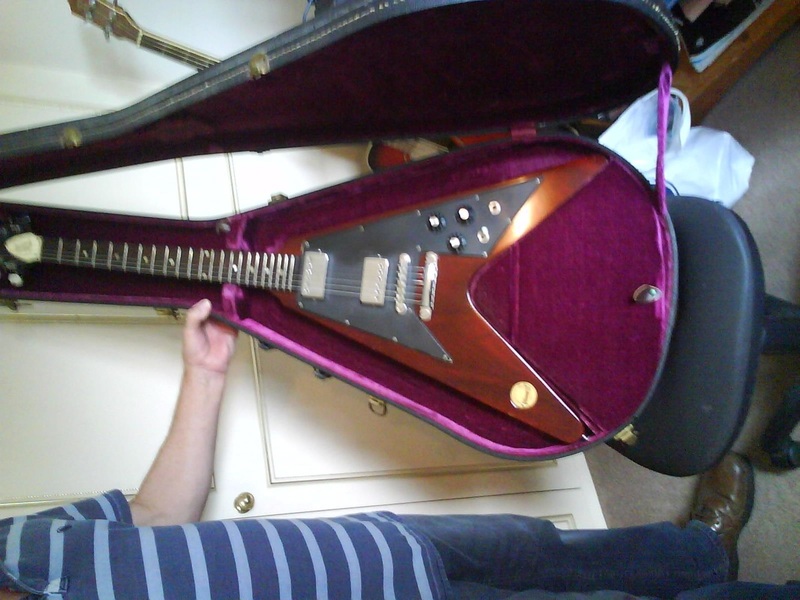 Pictured below: Headstock repaired, original pickup covers added and original tuners installed. Oct, 2018. 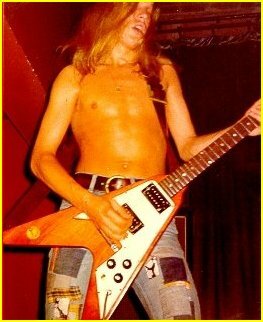 Take a look at the below picture....There are now no signs that this V ever had Grovers. 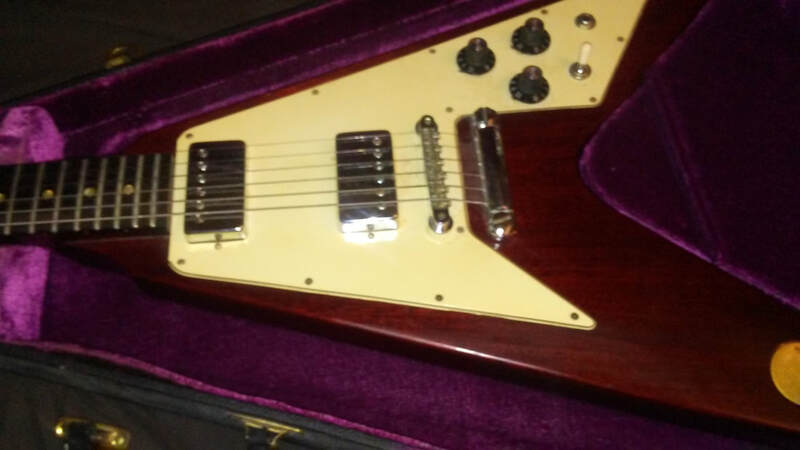 Flying V Medallion #110 (Grover tuners installed, pickup covers removed, pickup mounting rings added). 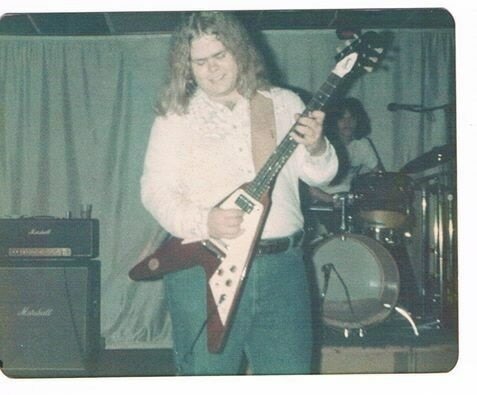 This picture was taken by your web host in 1976. 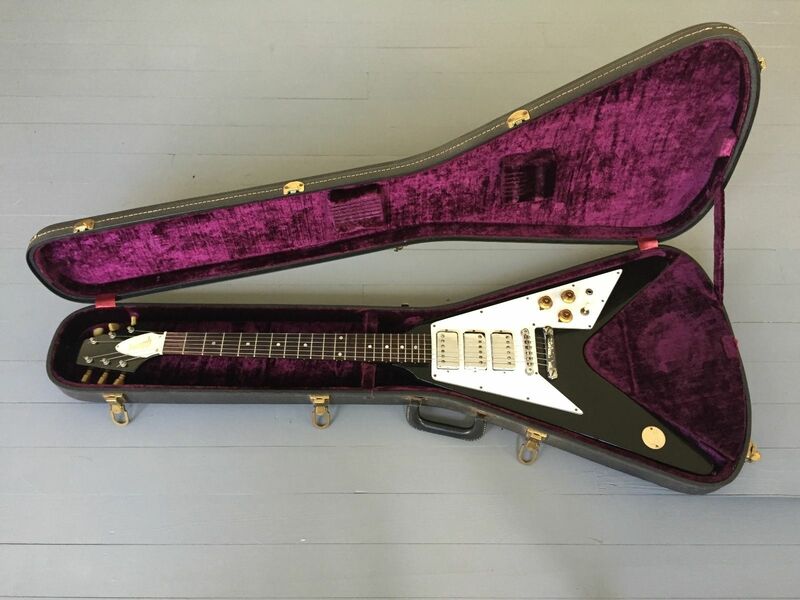 Flying V Medallion #118 (Original pickguard was replaced with one from a 1975 era Flying V. Pickup covers replaced with post-1977 covers, the case is a late 60's Flying V case). Added Dec. 2014. 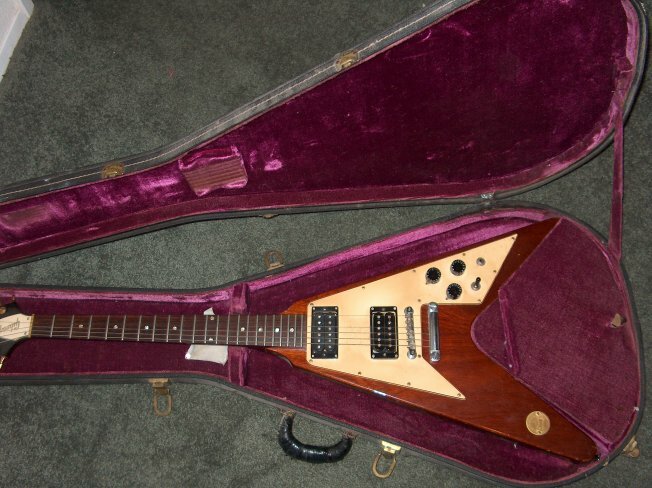 Flying V Medallion #122 (Maestro tremelo installed then later removed, Grover tuners installed, coil tap toggle switch added, pickup mounting rings added, Dimarzio pickup installed at bridge position, truss cover removed and bell truss cover installed, 1958 Gibson Flying V style logo added to headstock, speed knobs installed). Posted May, 2015. 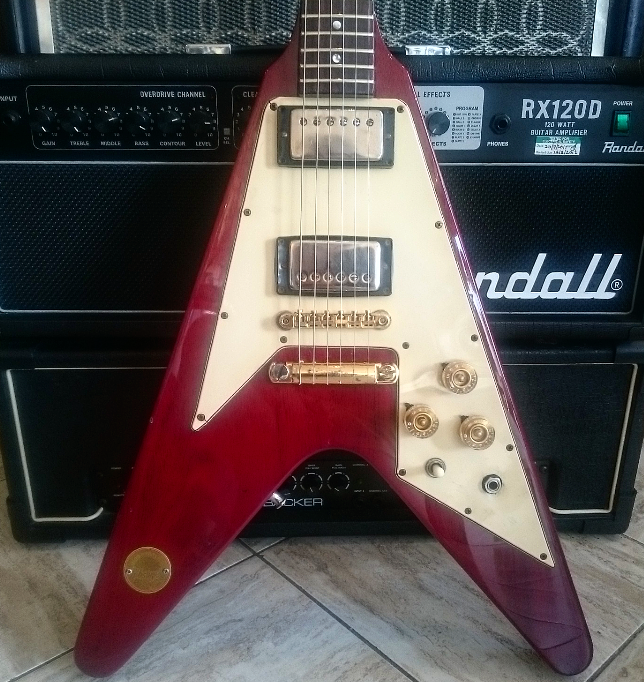 This same V (Medallion 122) underwent a restoration that put it back to original in 2018. It looks really good now (pictured below). It still has the tremelo holes and filled in holes on the pickguard. 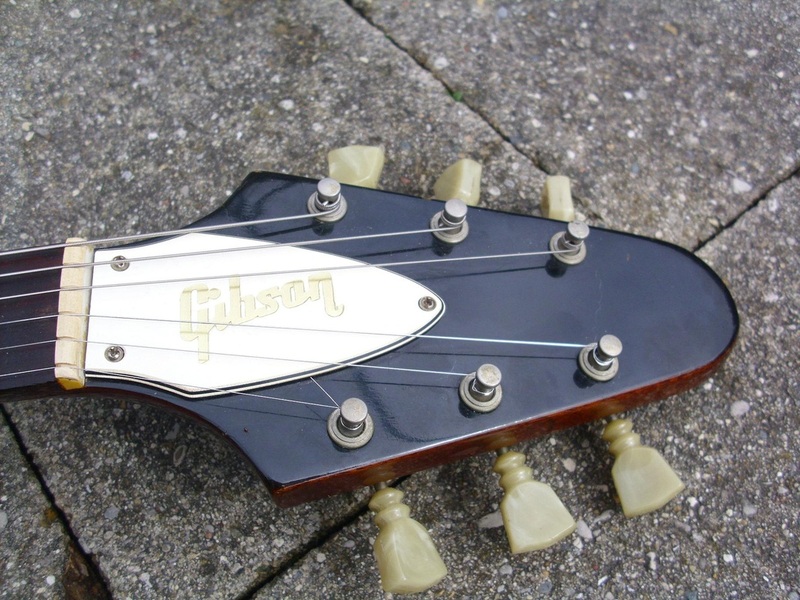 The restoration work that was done to the headstock is superb.